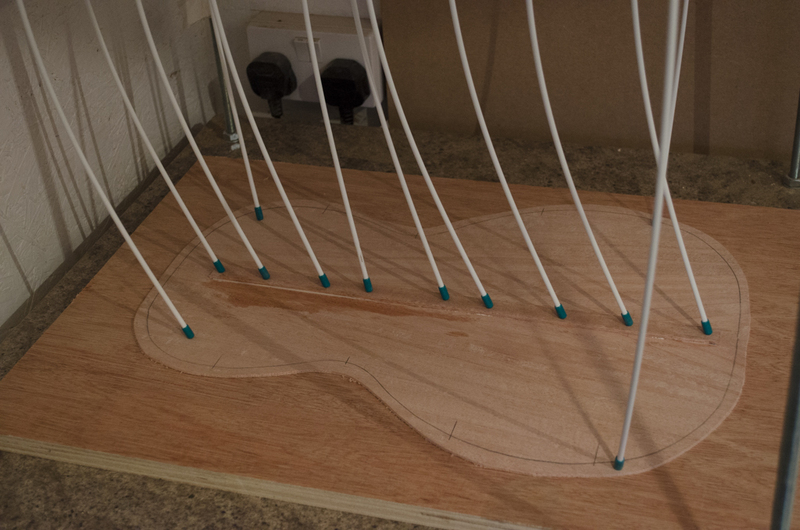 Over the weekend I also managed to make a lot more progress on other areas of the build including gluing up and carving the back braces and gluing up most of the soundboard bracing. 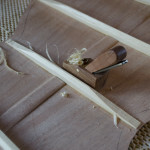 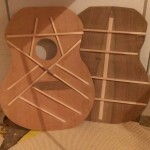 I also glued up the C shaped neck block but unfortunately forgot to take any pictures. 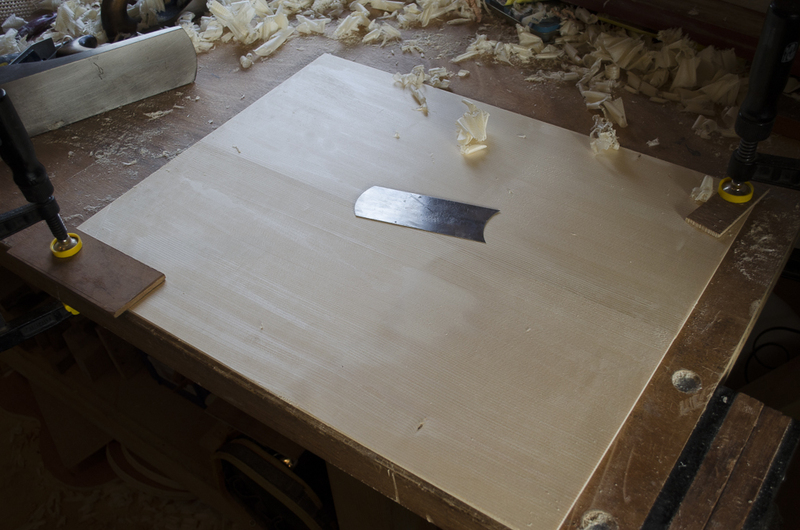 Next up will be carving the soundboard braces and preparing the sides ready for bending. 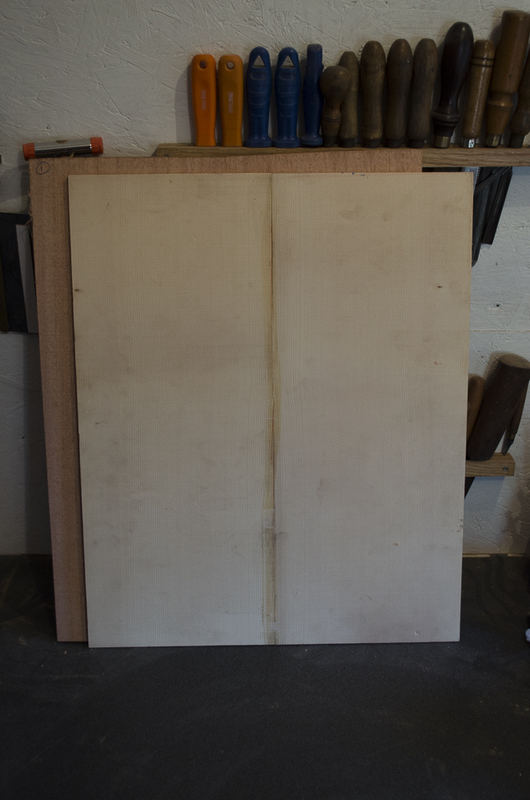 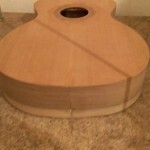 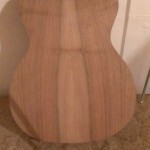 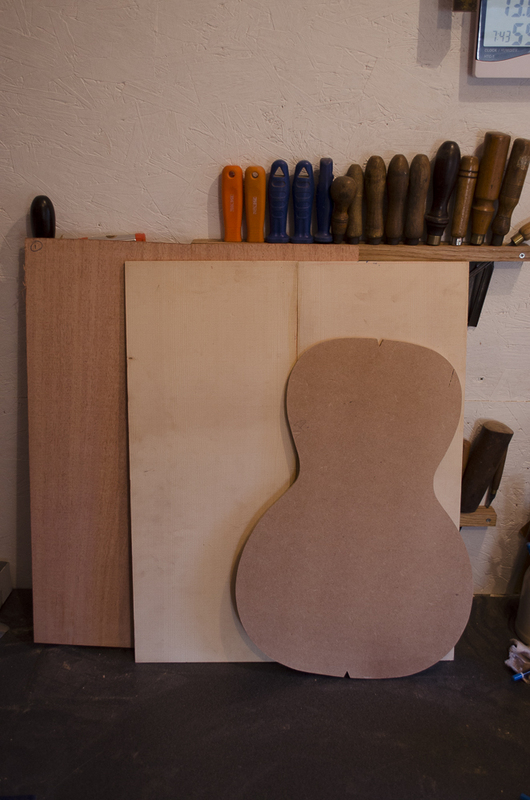 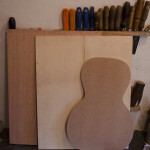 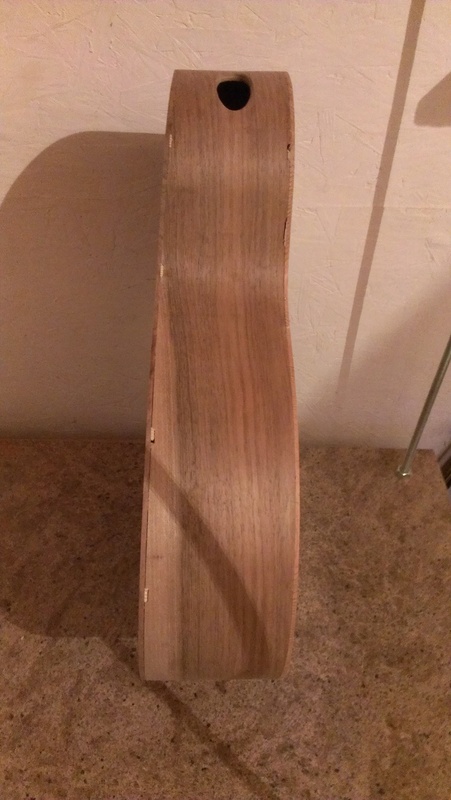 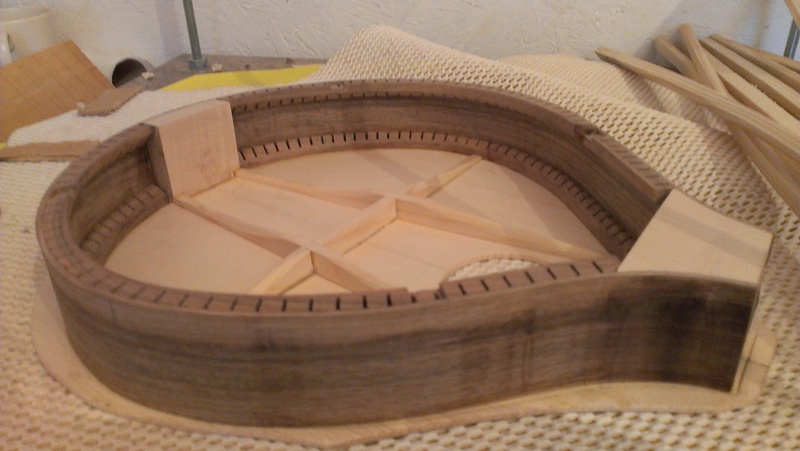 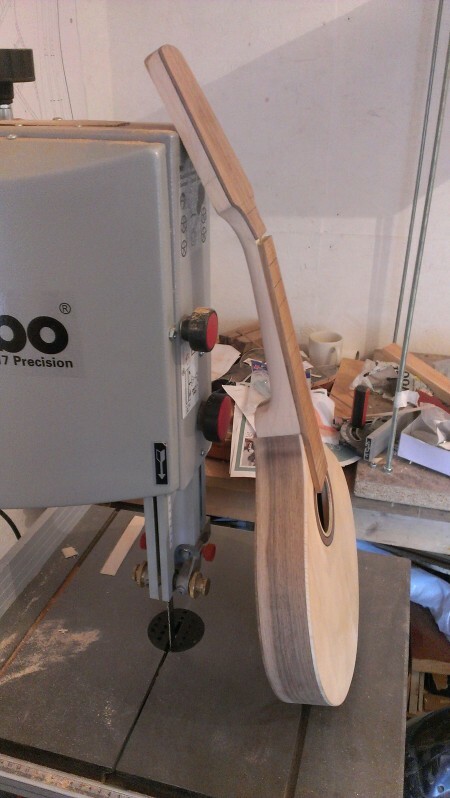 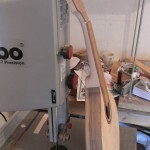 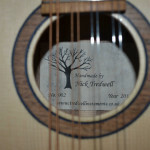 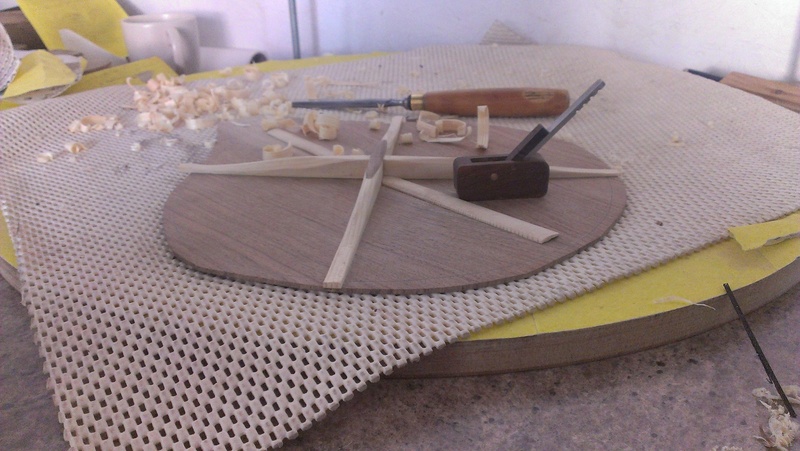 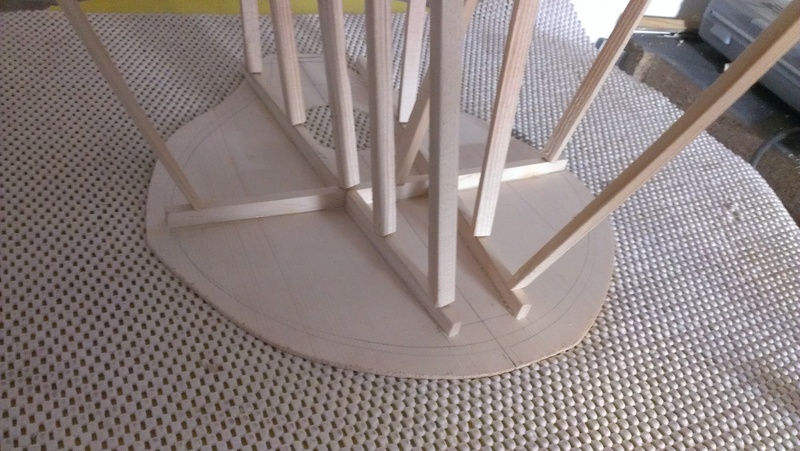 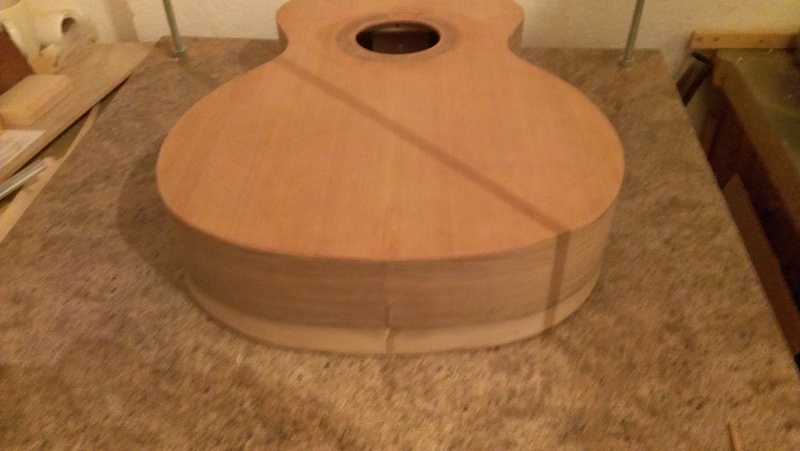 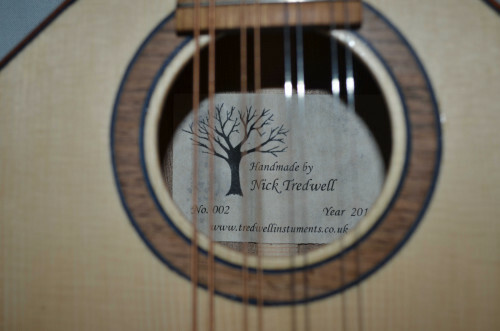 This entry was posted in Mahogany Parlour Guitar on March 25, 2014 by ntredwell. 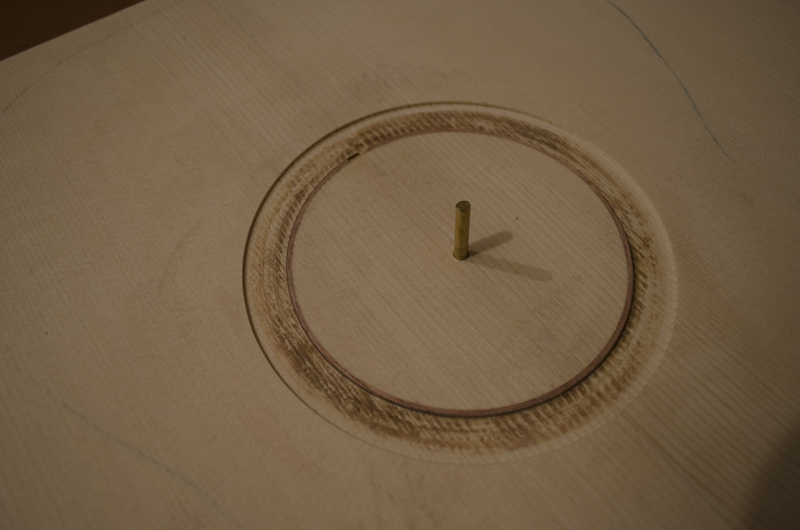 Well after the tribulations in my last post, I made sure to take things very slowly while fixing the rosette. 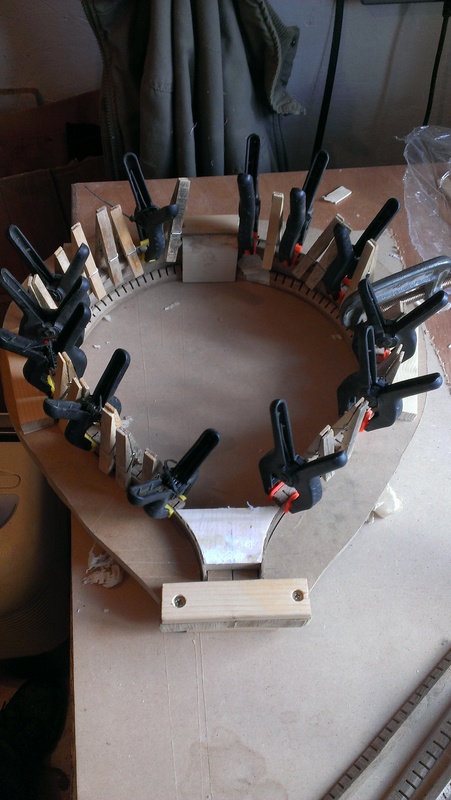 I decided the easiest option would be to re route the channels and install a new slightly wider one. 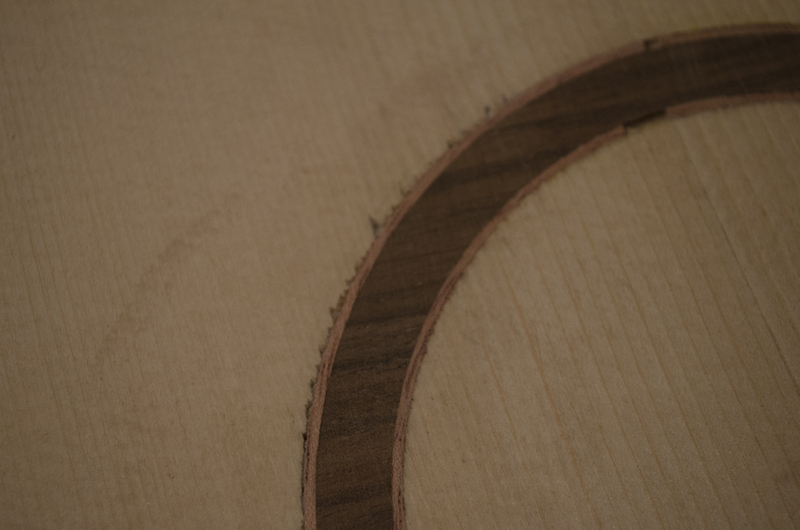 I routed out all but the inner purfling strip as this already had a perfect fit. 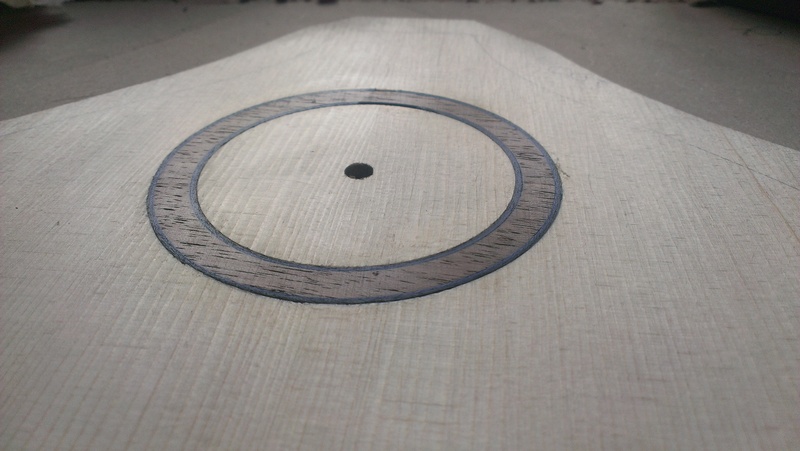 It was definitely well worth purchasing a 3mm down cut spiral bit for routing the rosette channels, and this time around things went very smoothly and after a small amount of tweaking of the rosette, it now resides snugly in the soundboard. 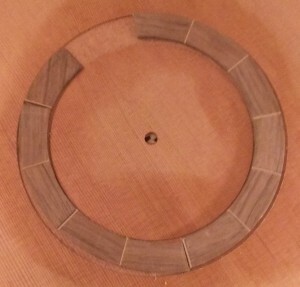 After gluing in the rosette and outer purfling strip, the excess height in the rosette needed to be planed back and finally sanded flush with the soundboard finally confirming that the fit is now flawless. 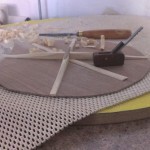 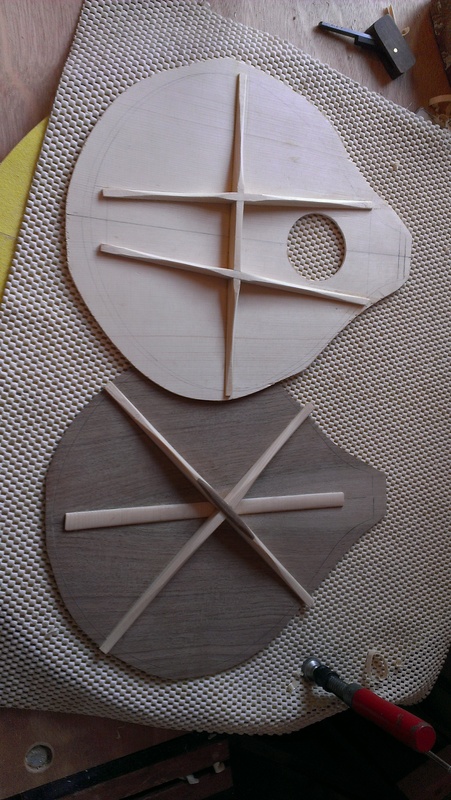 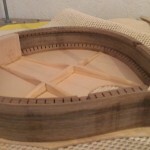 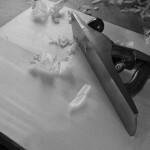 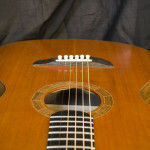 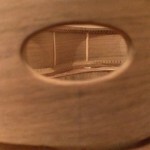 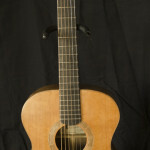 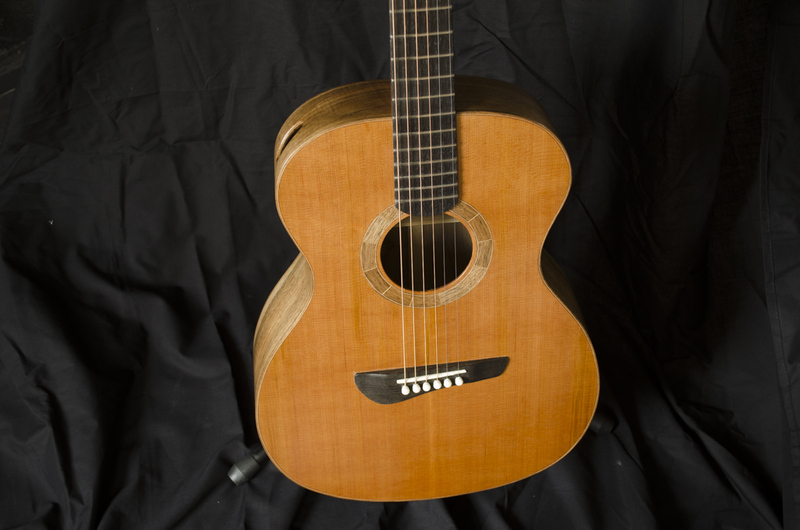 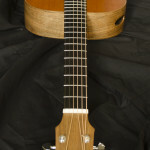 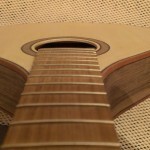 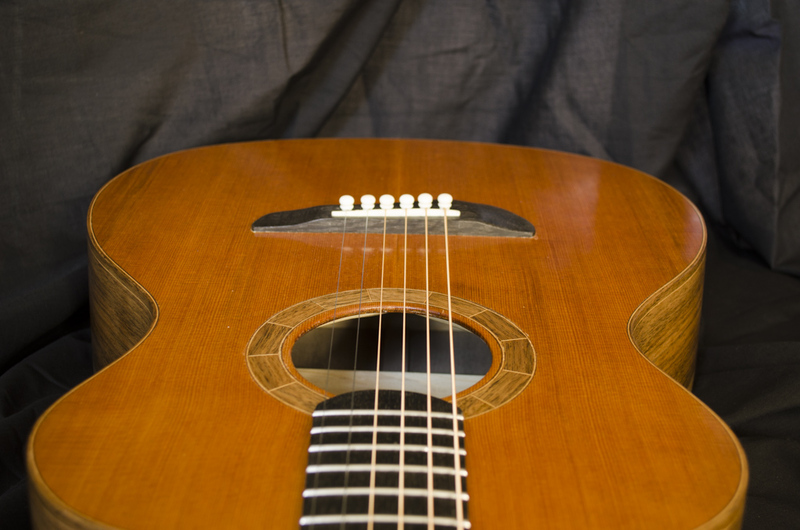 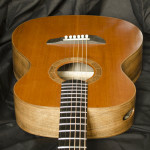 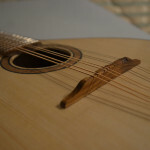 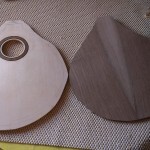 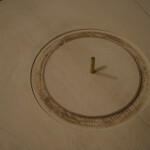 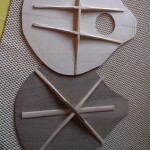 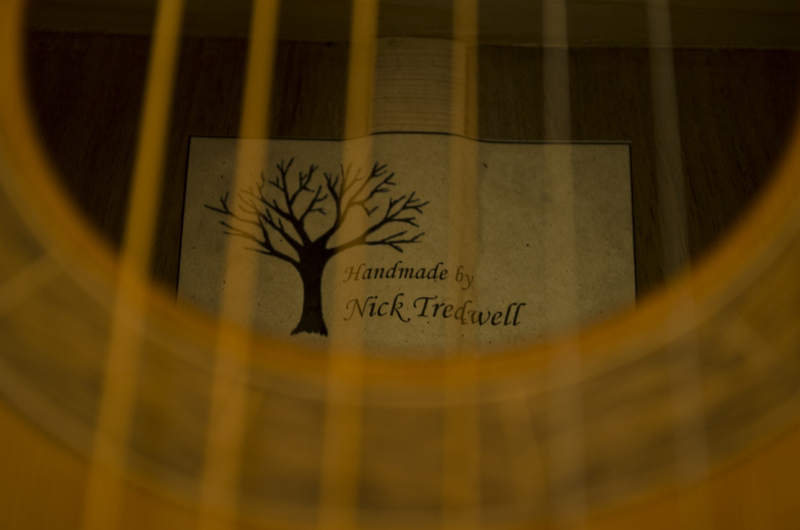 This entry was posted in Mahogany Parlour Guitar, Uncategorized on March 25, 2014 by ntredwell. 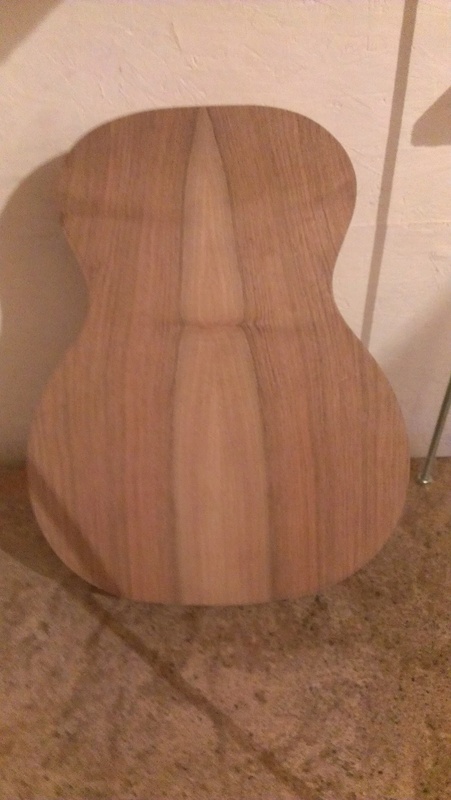 I have been wanting to build a mahogany parlour guitar for a while now and have been working on my own design for one on and off for a while. 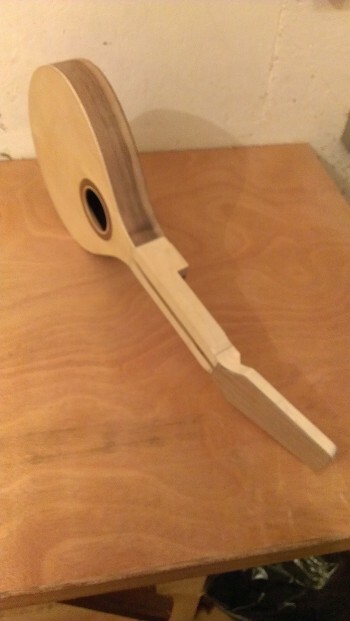 I plan to incorporate a new design feature for me which will be a completely removable neck utilising a continuation of the neck to support the underside of the fretboard as used by a number of other builders. 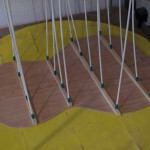 This type of construction makes much more sense to my thinking rather than the traditional method of gluing the fretboard extension to the soundboard and will allow for the neck to be removed very easily at a future date if ever required. 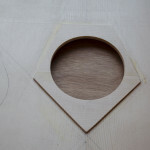 I have been working on this build for the last week, so I will bring things up to date quickly. 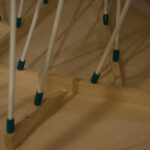 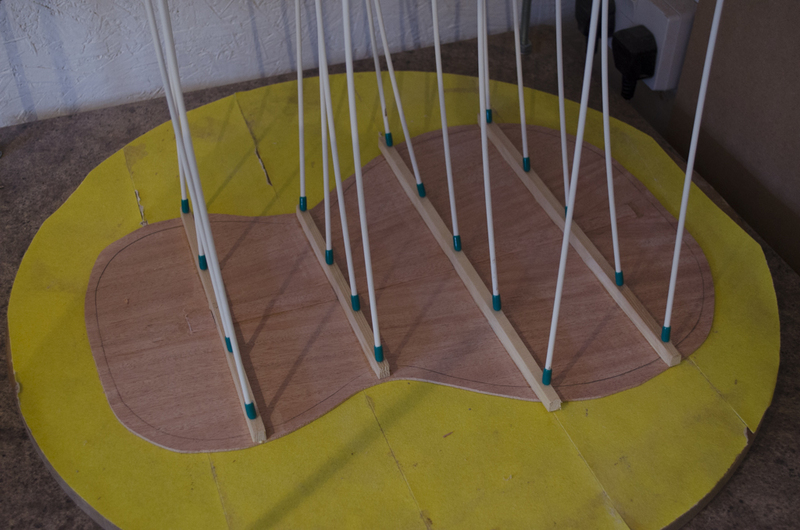 The first task was to get the back and soundboard jointed. 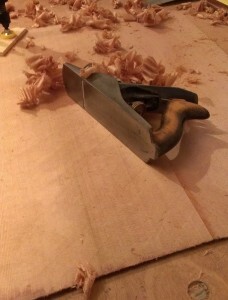 Next I sharpened up my trusty No. 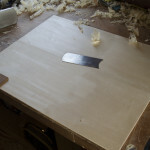 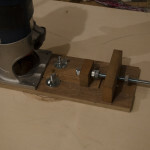 5 1/2 plane and a cabinet scraper and got under way thicknessing the plates. 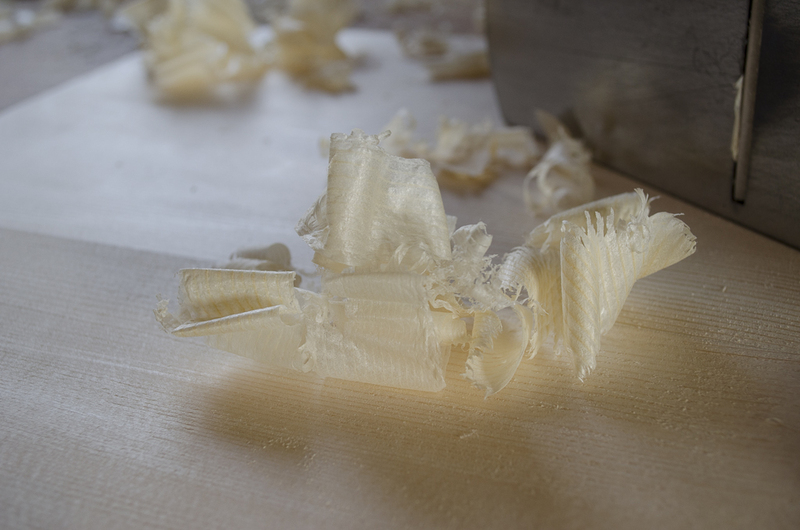 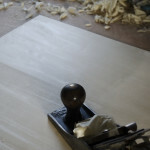 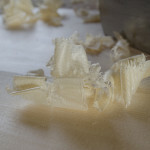 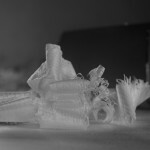 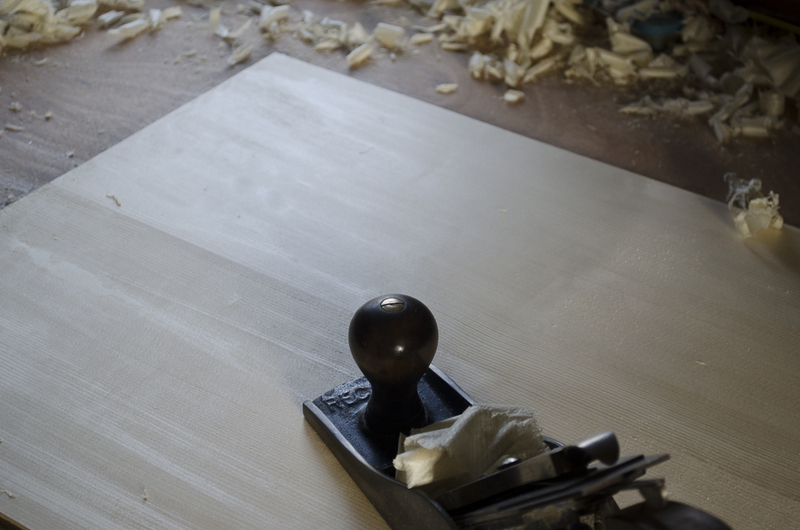 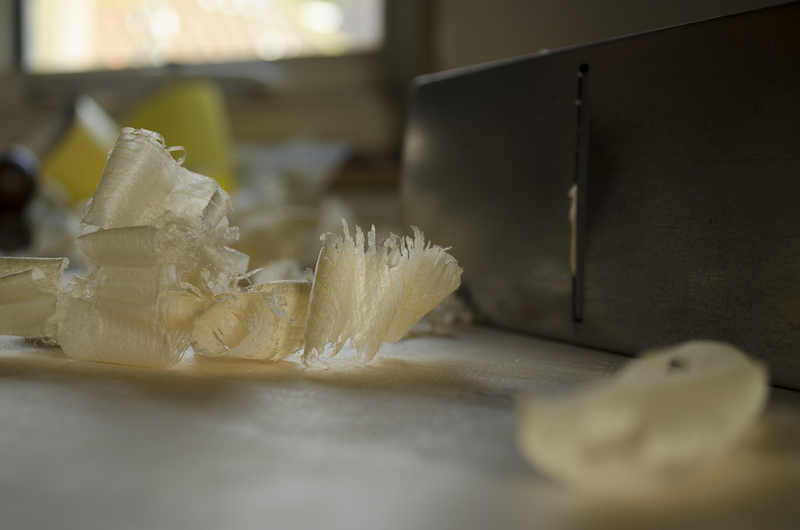 There is something really satisfying seeing fine shavings appear through the plane. 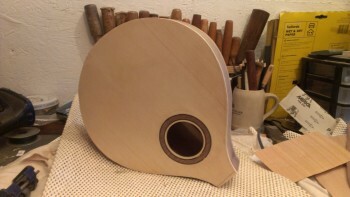 The back was taken down to just over 2.5mm but will be reduced a little bit further, and the soundboard was just flattened so that I can get the rosette installed. 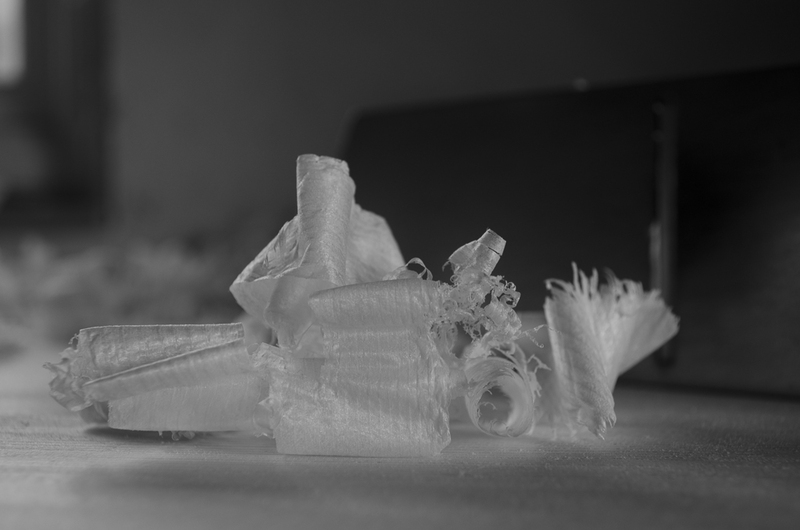 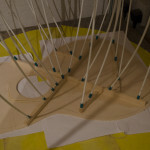 Unfortunately, I had a few issues with the rosette, and experienced quite a lot of tear-out on the outer edge of the rosette channel. 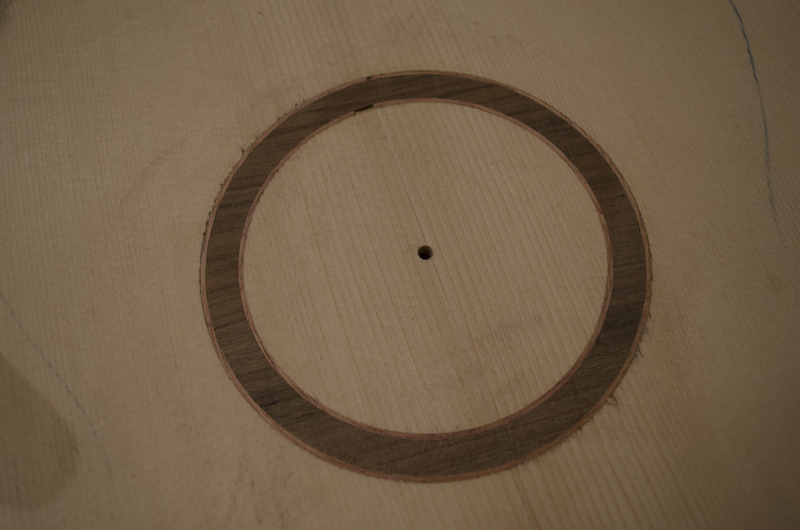 I did install the rosette that I had prepared to see how bad it looks, and judge it for yourselves, it has to go. 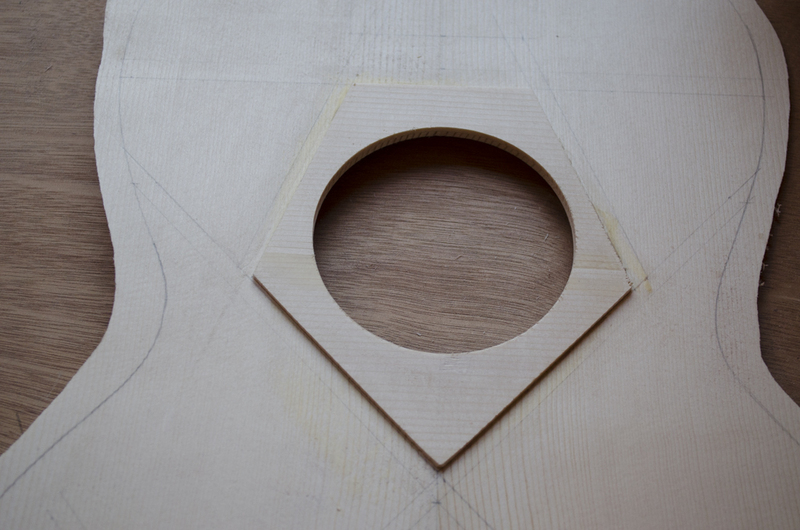 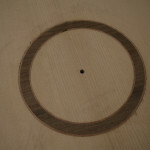 I have put the tear out down to a poor quality router bit, so I have ordered a new down cut spiral bit and am planning to route out the rosette and start again with a slightly wider one. 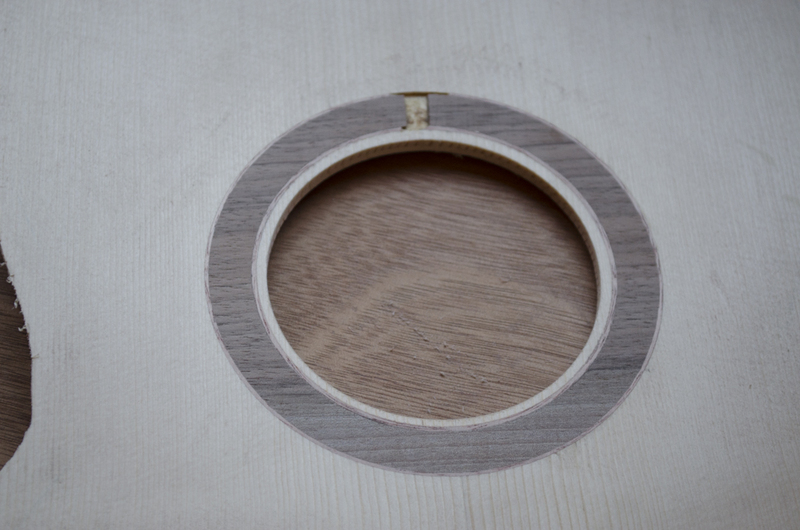 Its extremely frustrating having to scrap the original rosette but If I don’t it will annoy me every time I pick the guitar up. 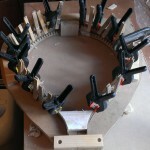 Hopefully I will get some time over the weekend to install the new rosette and get started on the bracing. 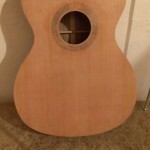 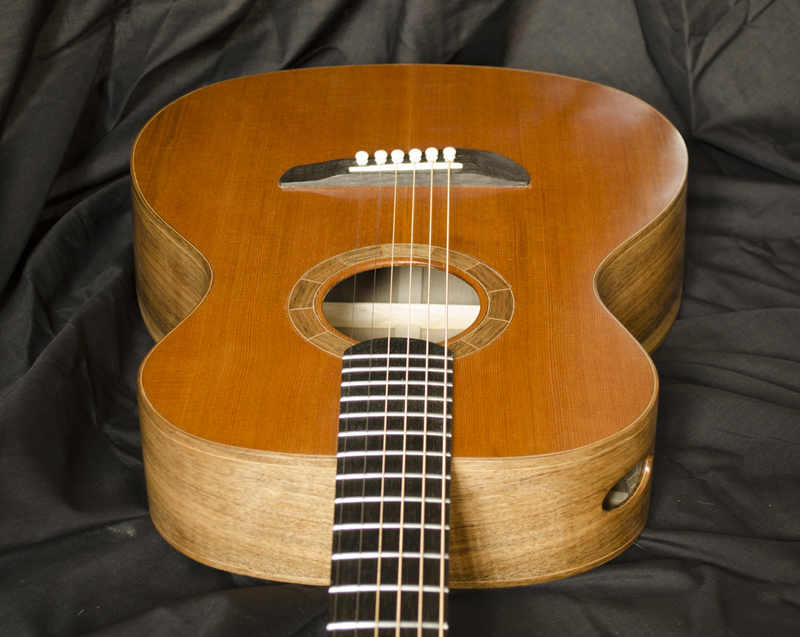 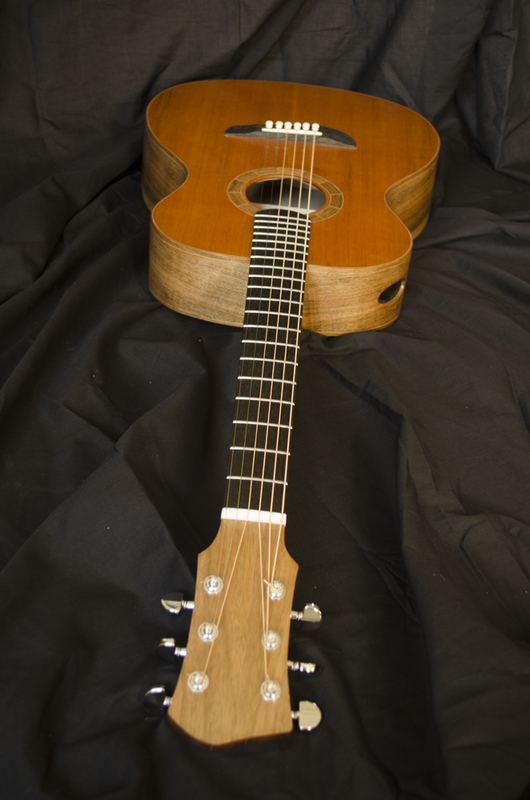 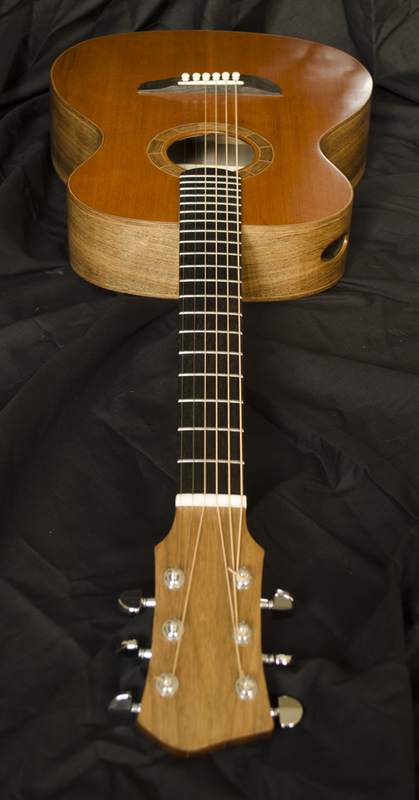 This entry was posted in Mahogany Parlour Guitar, Uncategorized on March 20, 2014 by ntredwell. 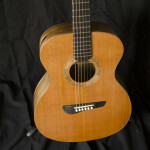 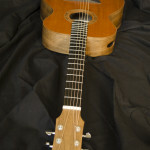 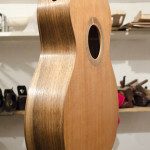 So here are the finished photos of my English Walnut and Cedar 00 sized guitar. 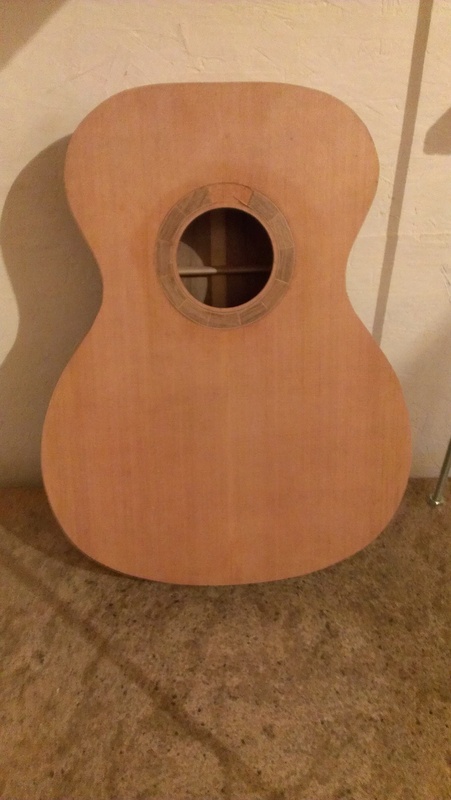 I have been playing her for a few weeks now and I am definitely pleased with the sound and am really looking forward for the sound to develop in the coming months. 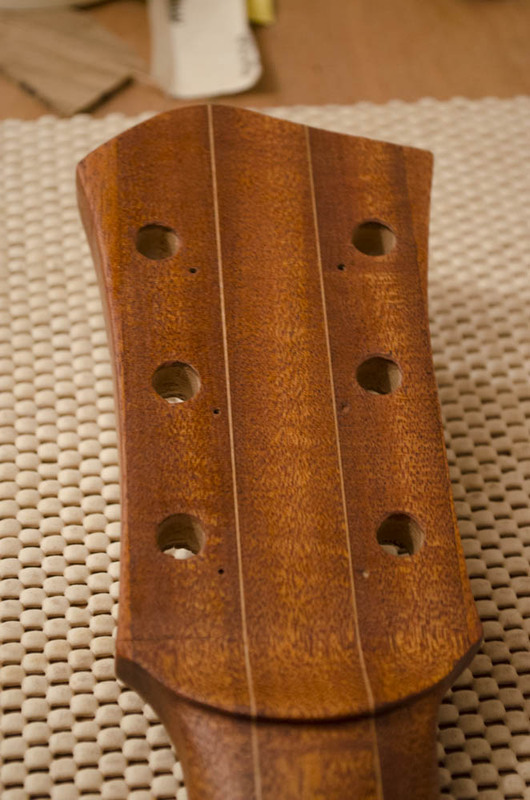 I have used a new headstock shape on this build, and I will be utilising this design on future builds. 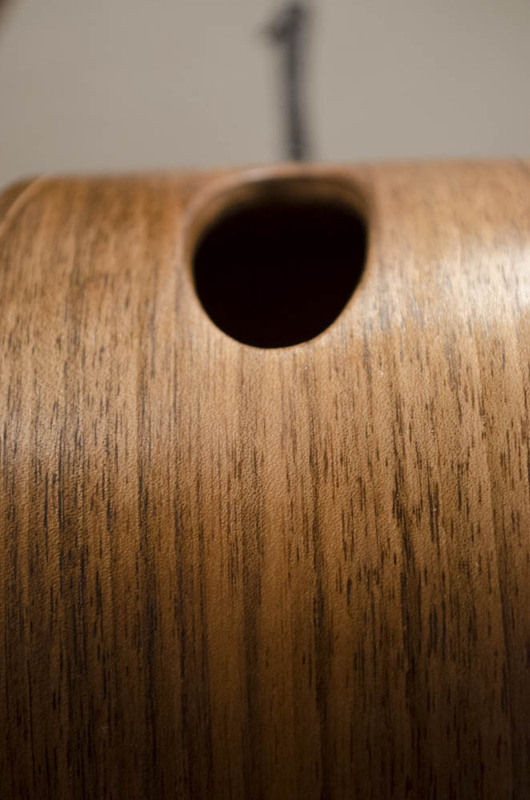 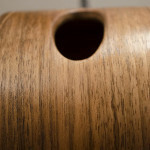 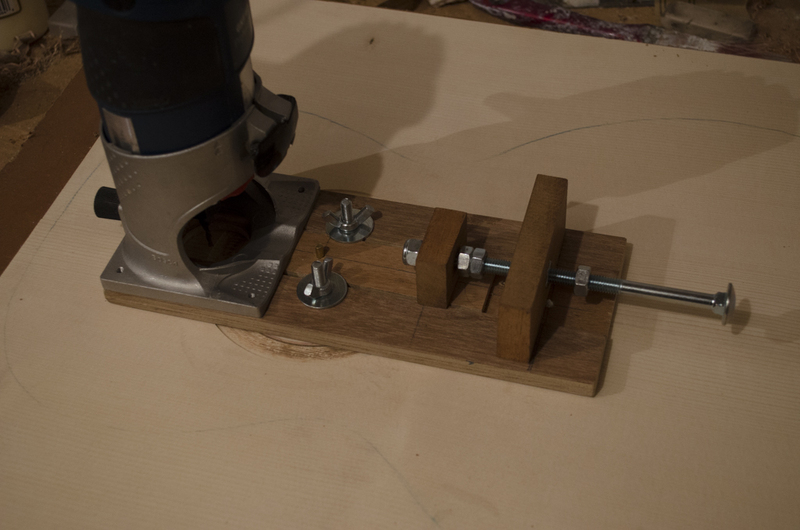 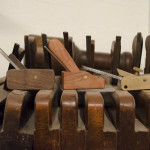 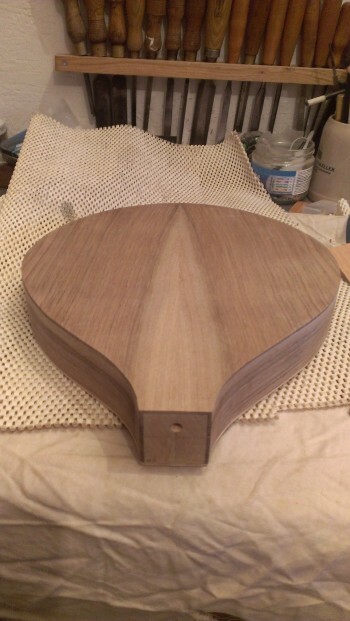 This entry was posted in English Walnut 00, Uncategorized on March 4, 2014 by ntredwell. 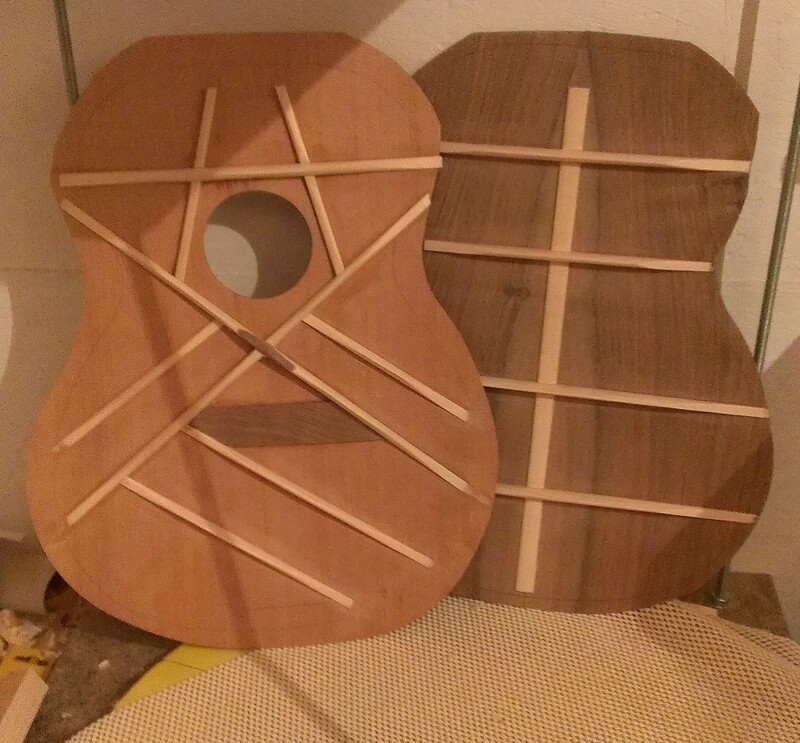 I strung up the Walnut and cedar guitar for the first time last night, and I am very happy with the sound, I have only managed a quick play so far and she has not yet had the saddle cut and a set-up but it’s looking very promising. 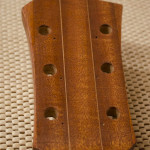 Just waiting on some micro mesh sandpaper so that I can polish off the finish. 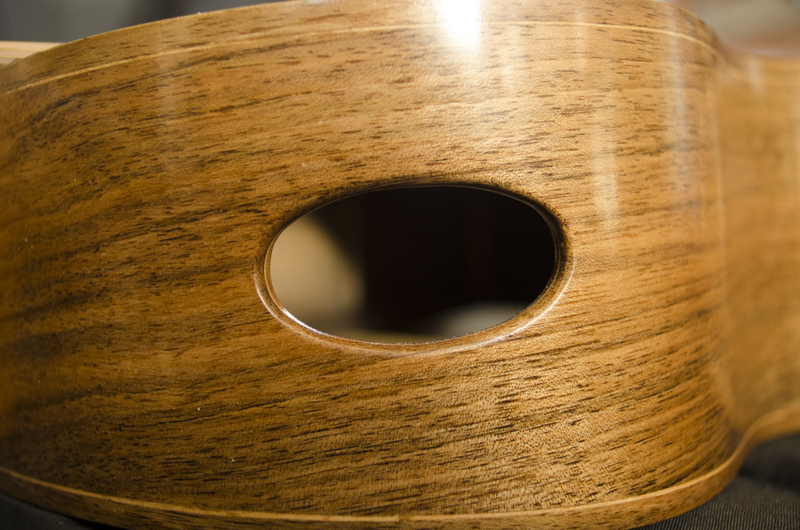 Pictures coming soon. 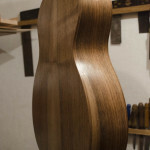 This entry was posted in English Walnut 00, Uncategorized on February 14, 2014 by ntredwell. 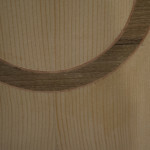 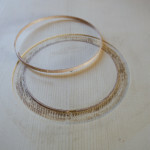 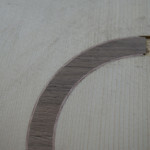 I am getting closer to the finishing line with my walnut and cedar 00 and am now in the process of applying the finish. 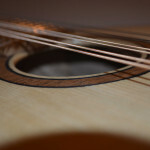 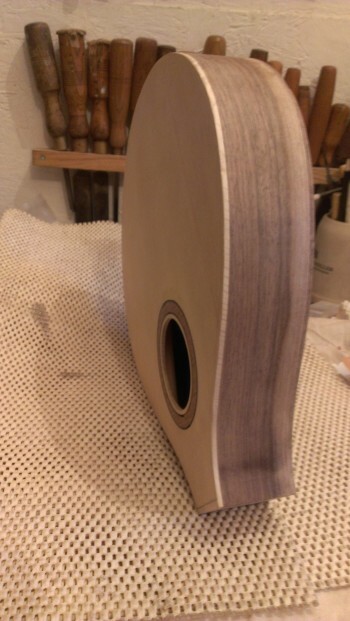 Woods such as Walnut need to have their pores filled, to do this I decided to use egg whites again, which I applied by dipping a piece of 240 grit sandpaper into the egg whites and then sanding the back and sides of the guitar to create a slurry which is then pushed into to pores. 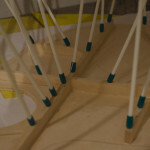 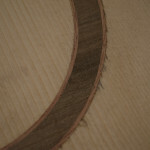 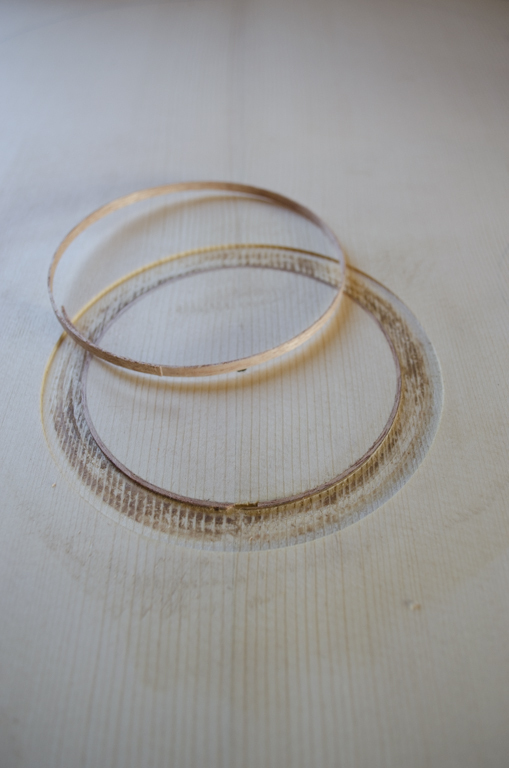 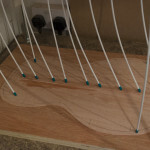 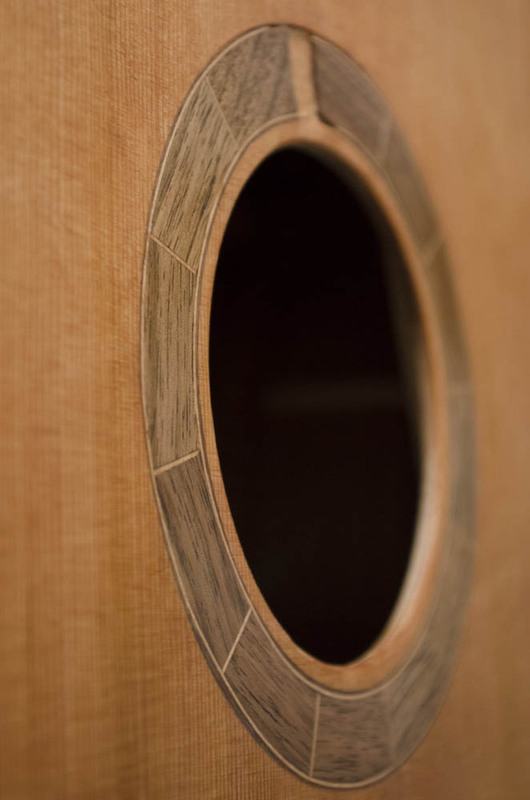 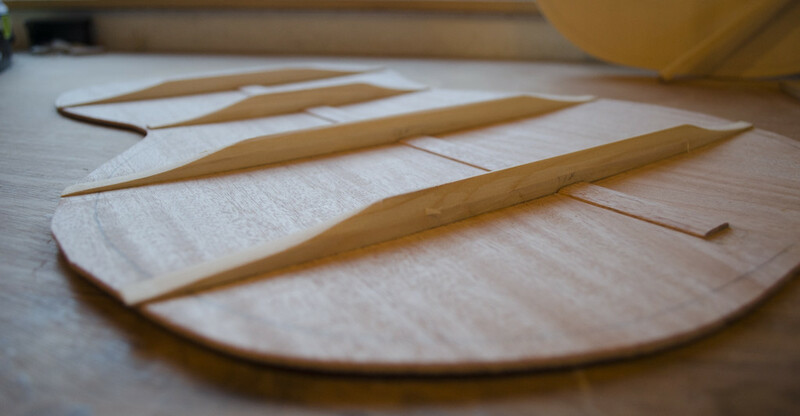 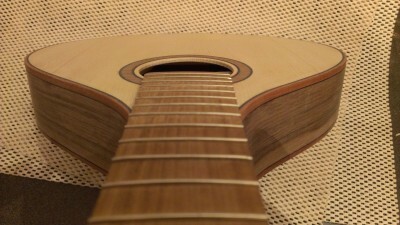 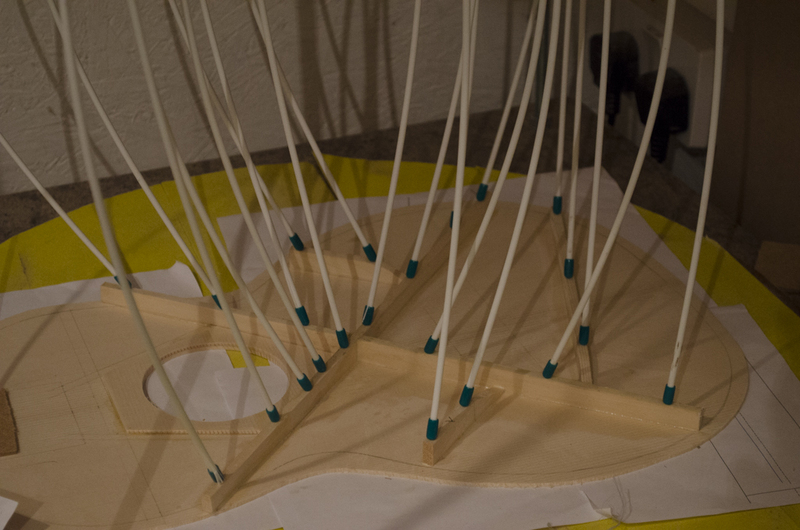 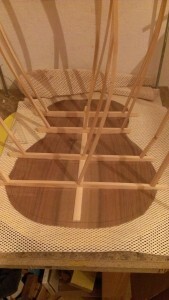 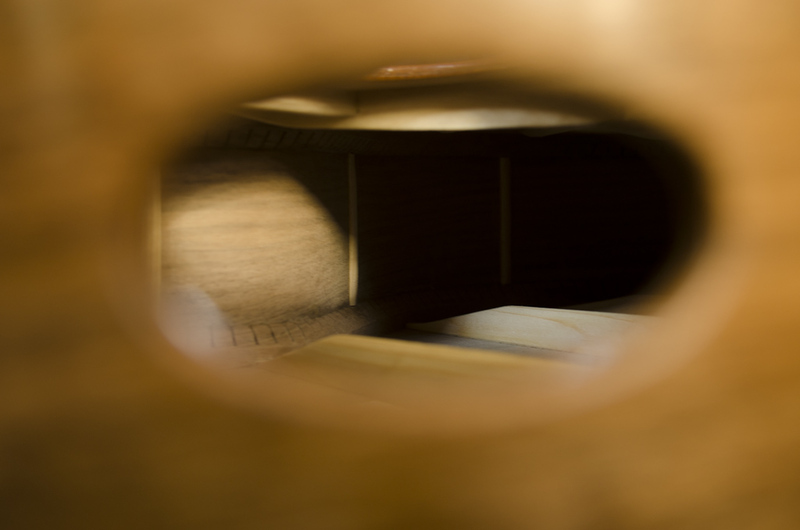 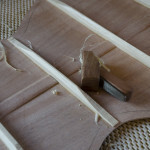 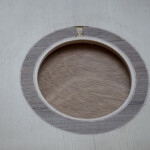 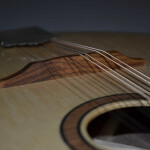 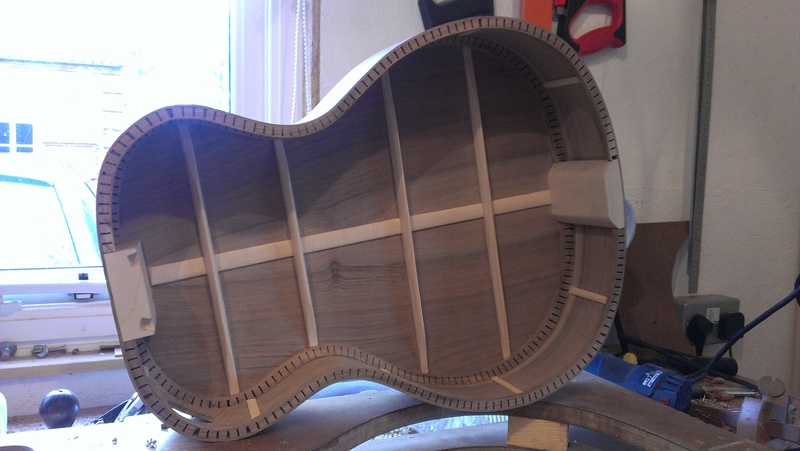 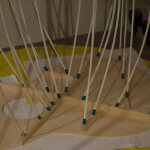 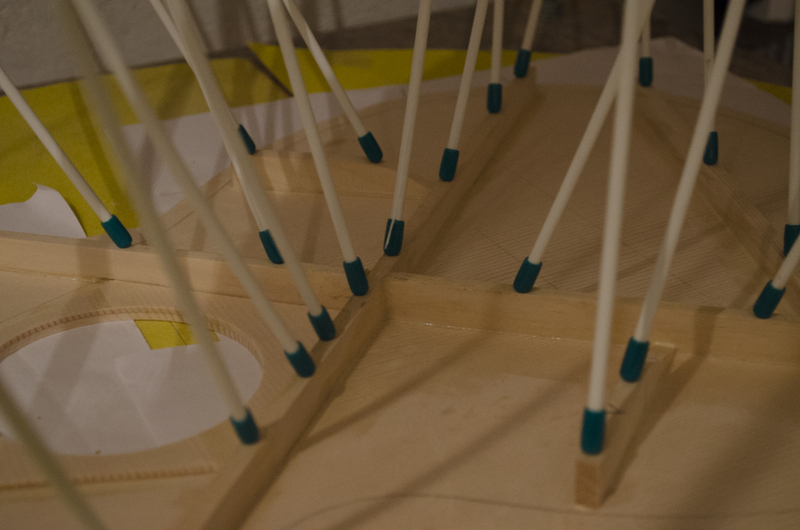 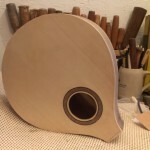 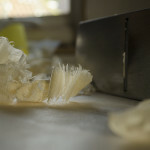 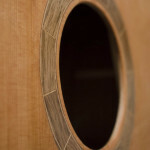 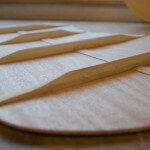 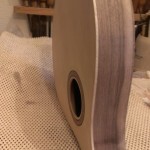 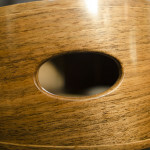 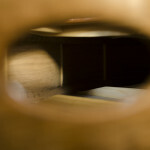 After the egg whites have dried, the guitar body needs to be sanded back level so that the filler is just left behind in the pores and the process repeated until all of the pores are filled. 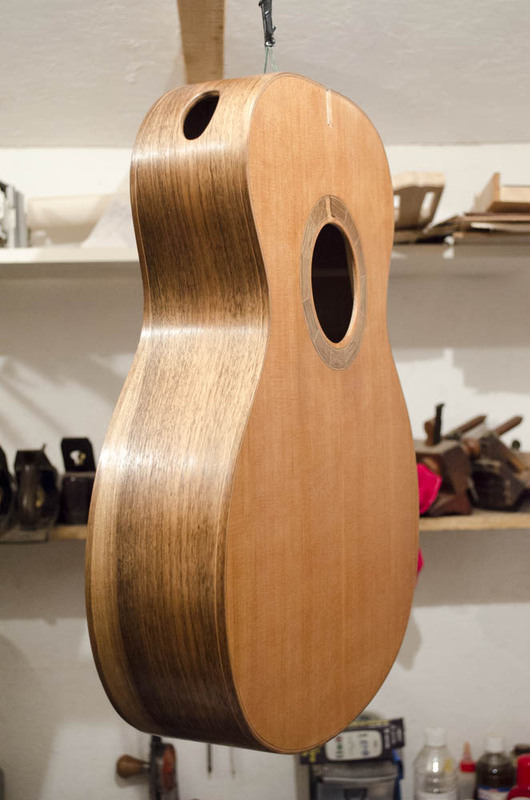 Once the pore filling is complete, it is time to get on with applying the finish which in this case is Liberon Finishing Oil. 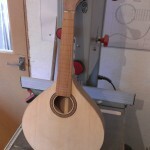 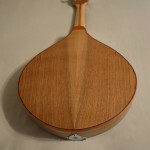 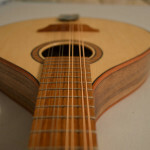 This will be the third instrument that I have finished in this way and I really like the look of the finished article. 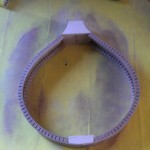 The oil is applied using many very thin coats (10-15) that are simply rubbed on with a lint free cloth. 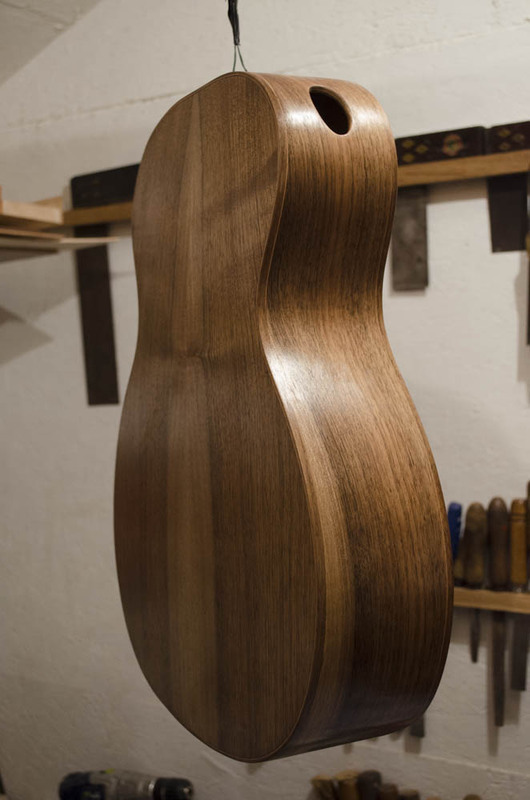 At this time of the year, if you are lucky you can get 2 coats done per day, but unfortunately having a day job means that it is only possible to apply a single coat each day. 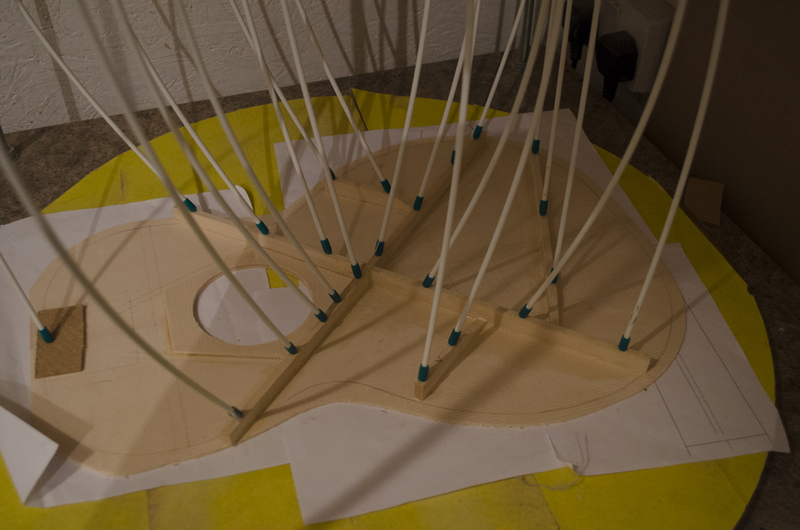 However, I am over half way through the coats. 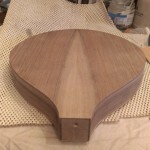 This entry was posted in English Walnut 00 on January 28, 2014 by ntredwell. 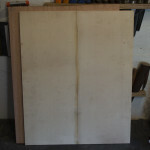 I have been keeping this one hidden for a while although it was completed a number of months ago. 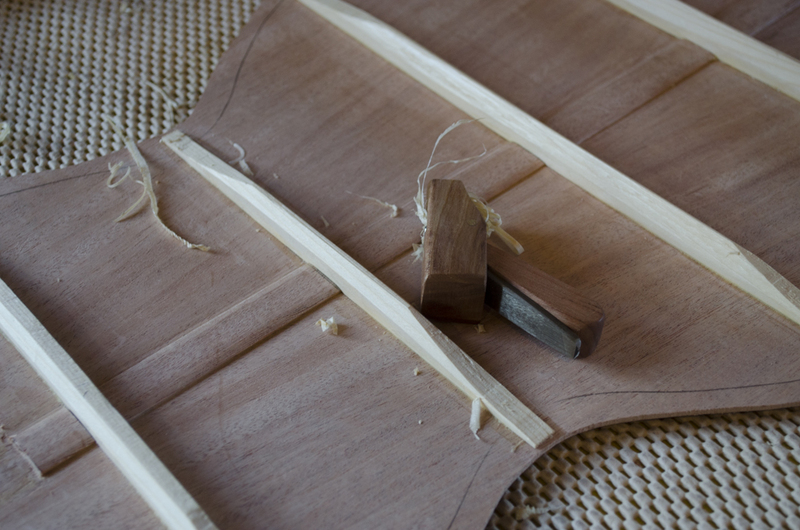 However, the flat top mandolin was being built as a Christmas present and I was trying to keep things secretive. 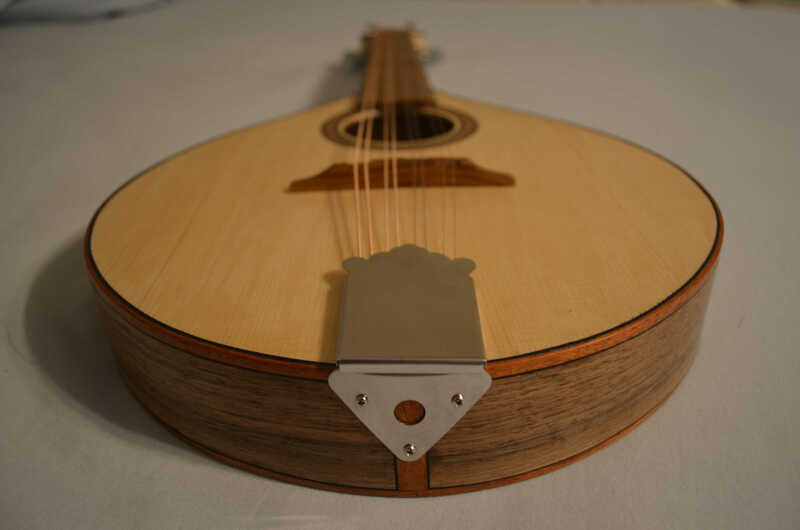 But now that the recipient has it I can reveal all the new owner had been talking about getting a mandolin for a while, and what better than something handmade. 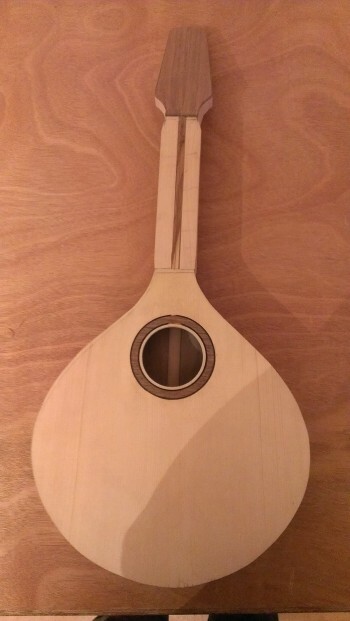 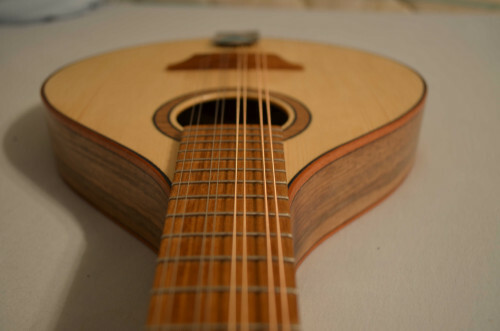 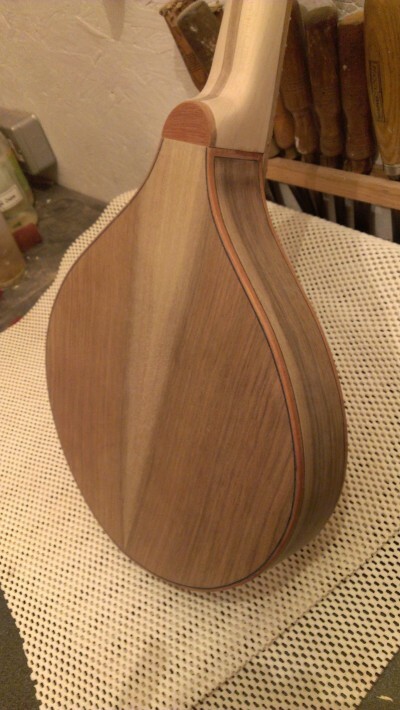 For the walnut mandolin, I decided to go for a flat top / back mandolin built in a similar method to an acoustic guitar rather than using carved top and back plates. 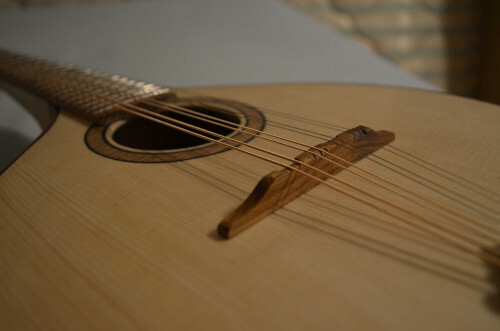 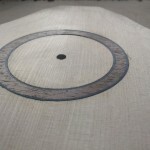 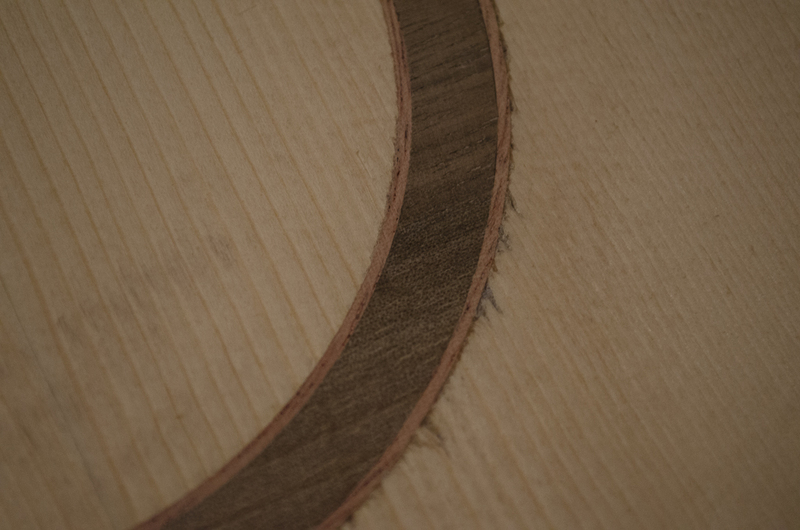 The term flat top is slightly deceiving, as there is actually an radius to both the soundboard and back. 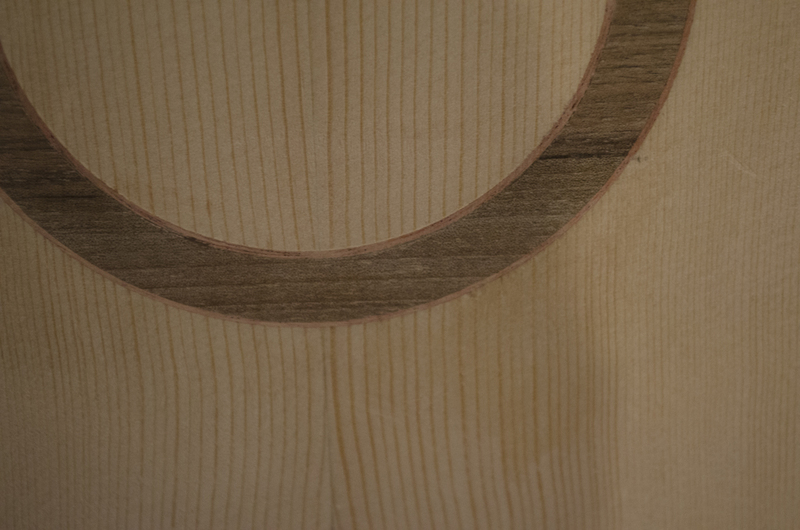 This has been induced by using radius braces. 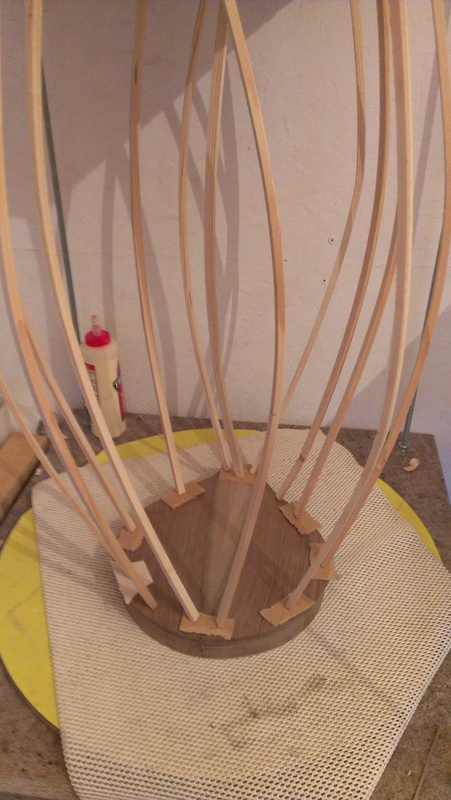 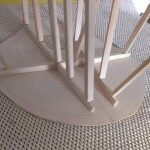 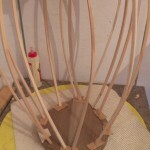 and gluing up in a radius dish. 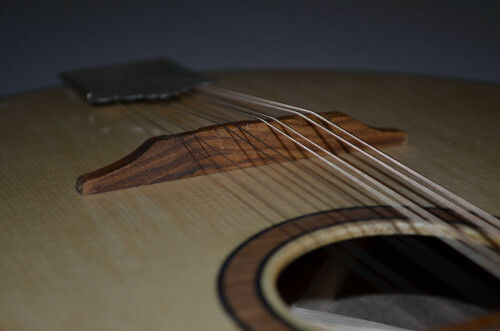 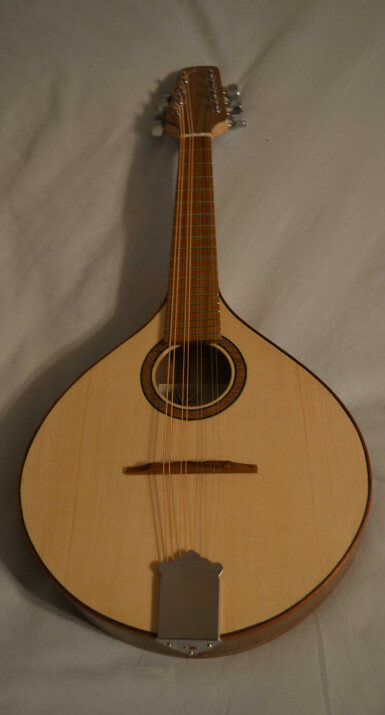 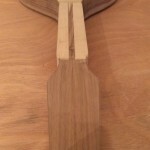 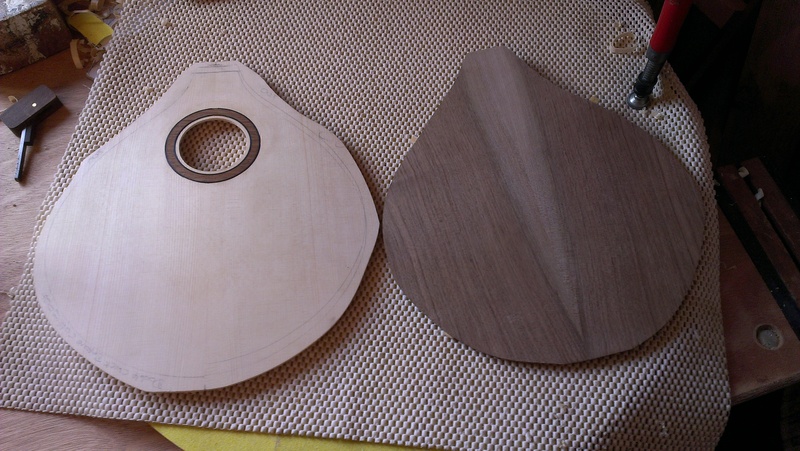 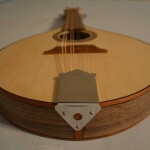 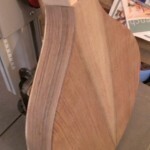 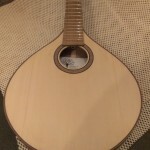 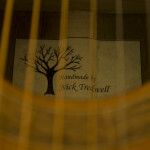 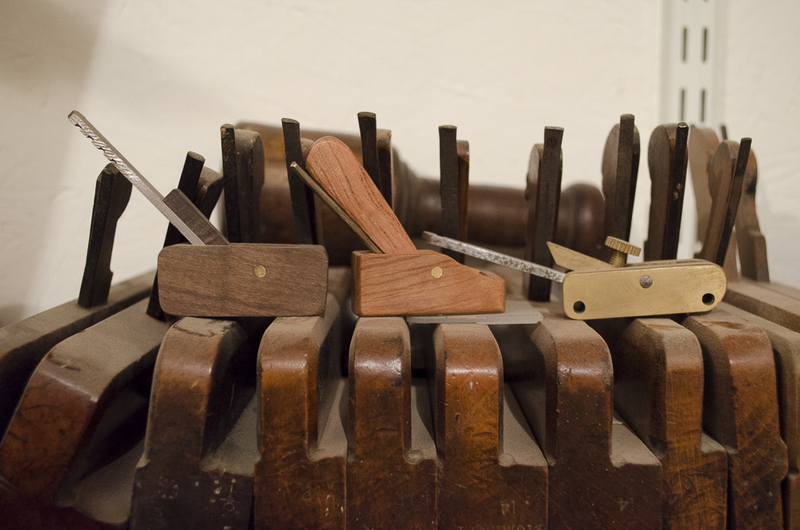 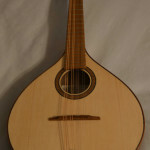 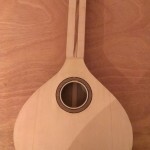 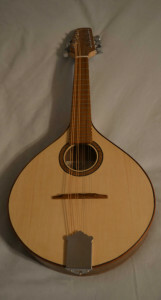 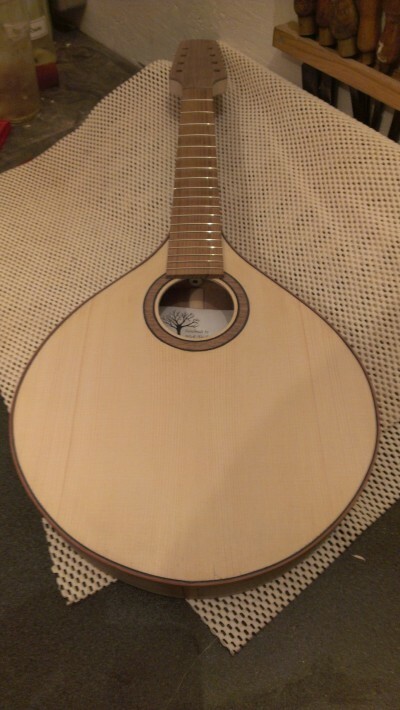 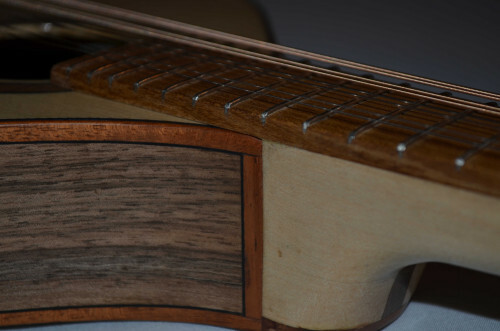 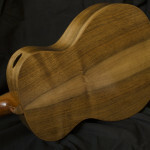 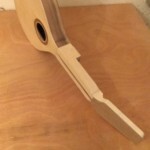 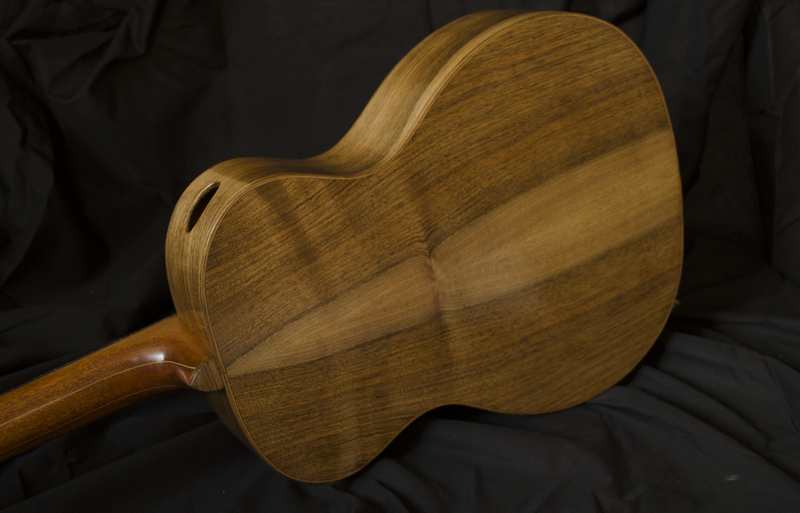 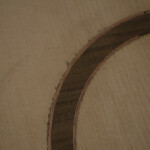 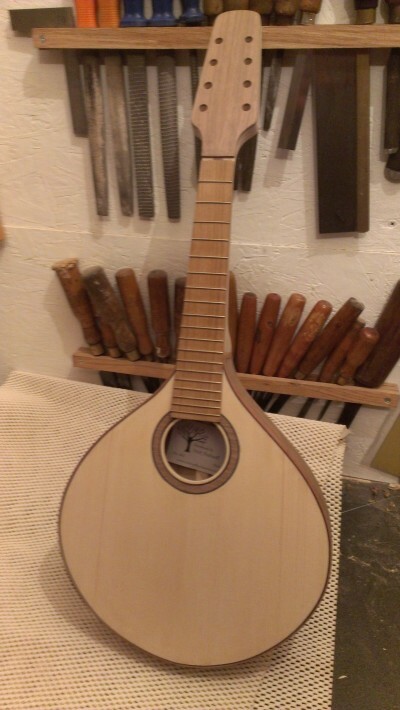 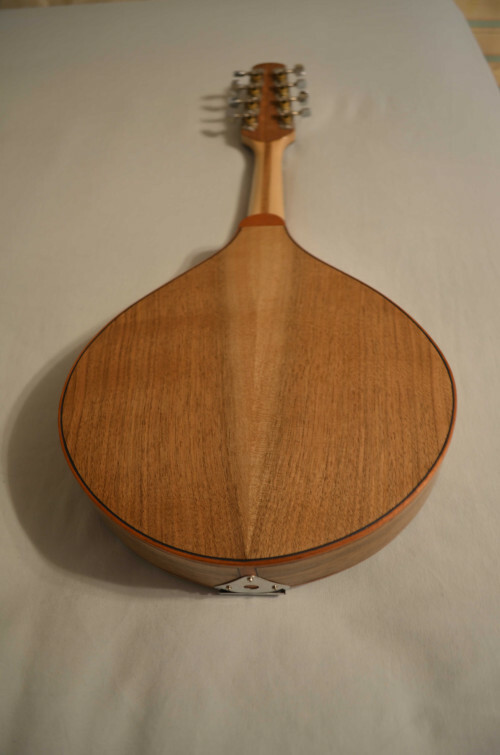 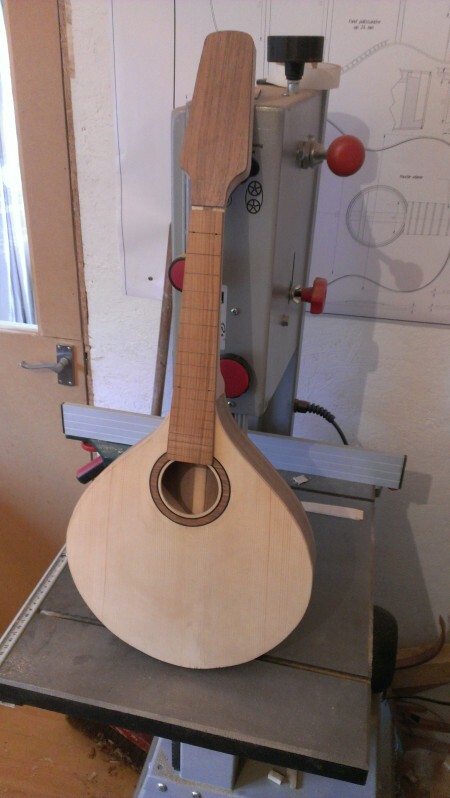 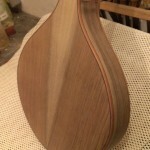 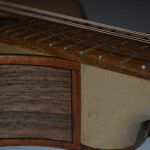 This entry was posted in Walnut flat top Mandolin on January 3, 2014 by ntredwell. 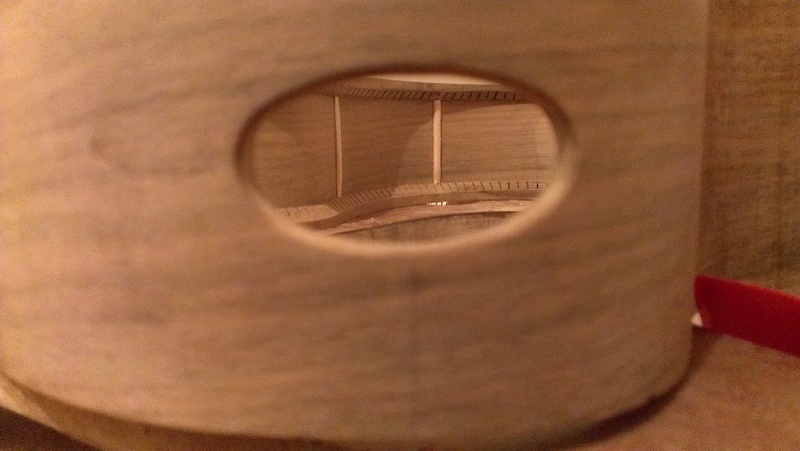 I have decided to add a sound port to this build, which should allow the sound to also be projected upwards towards the player allowing them to monitor their own sound. 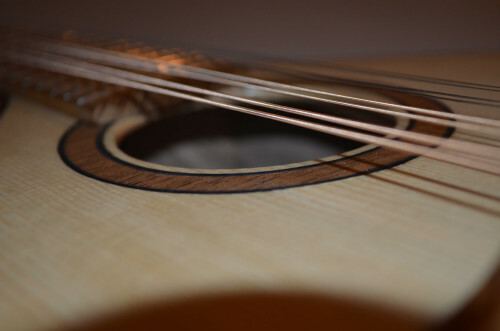 This is a new to me, but I like the theory behind adding one so we shall see. 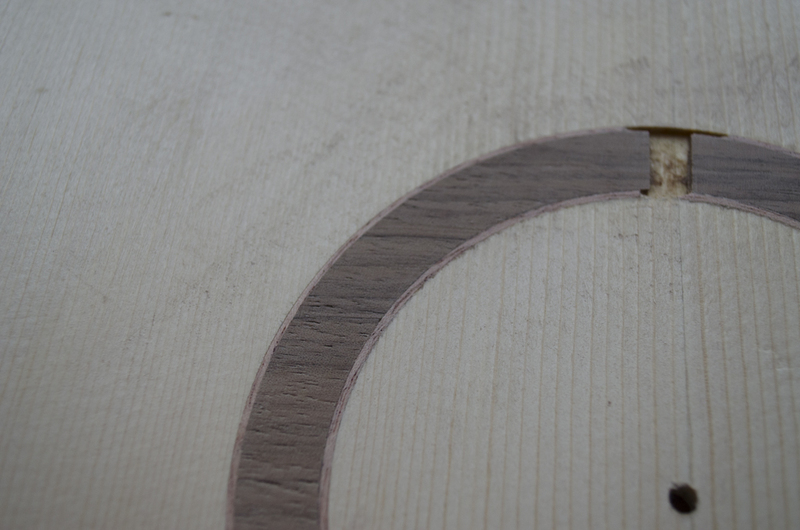 To do this, I reinforced the area inside the body where the sound port would be cut out with a thin sycamore veneer and backed up with a thicker walnut veneer so that you will see a pin stripe effect in the cut out. 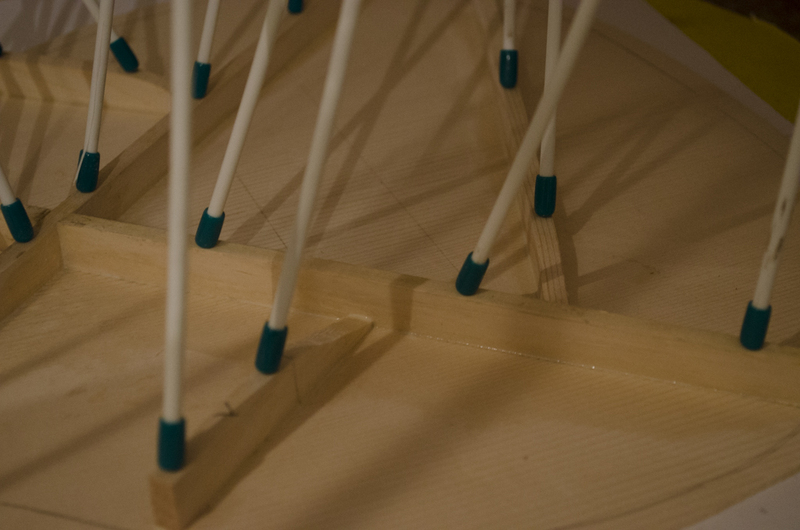 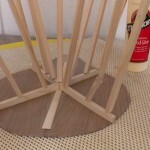 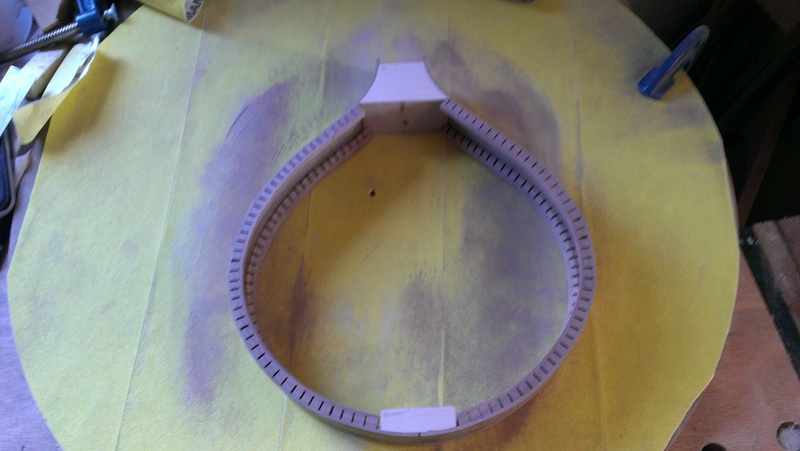 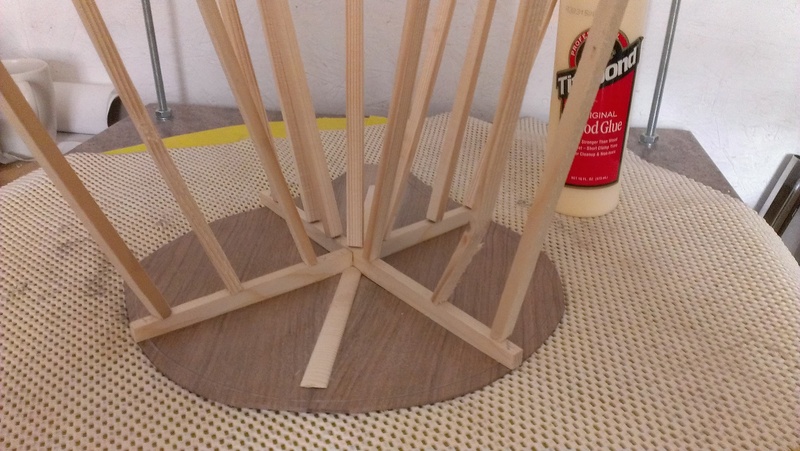 After attaching gluing a paper template to the upper bout, I carefully drilled a series of holes around the perimeter and then cut out the bulk with a coping saw before finally refining the shape with a small sanding wheel in the Dremal and needle files. 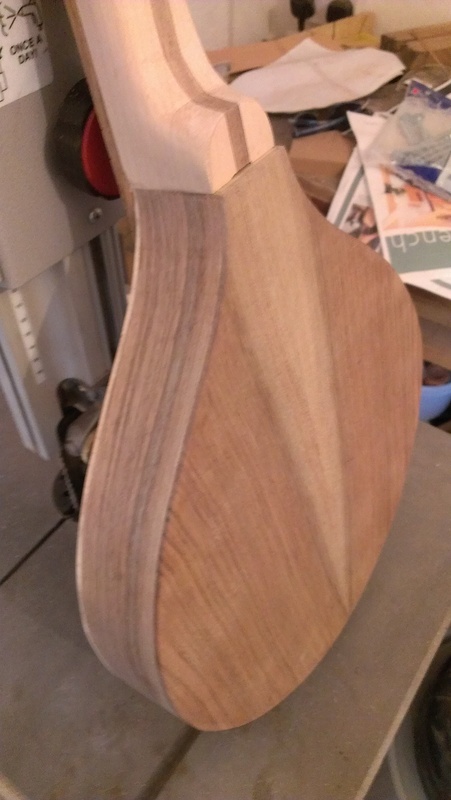 There is still some more refining to do, but I will do this when I prep the whole body for finishing. 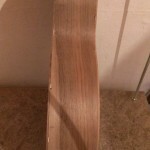 This entry was posted in English Walnut 00 on December 23, 2013 by ntredwell. 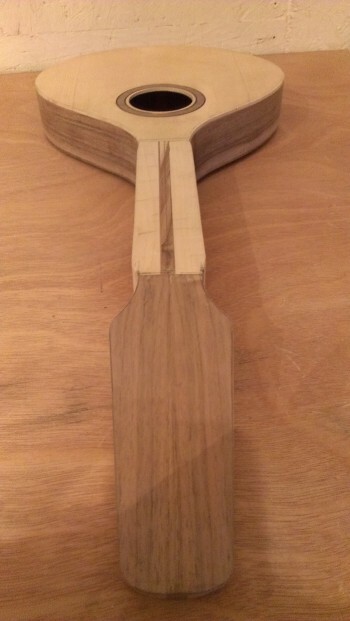 We I managed to get a few hours work in on the build over the weekend, and managed to get the back braced the along with the initial brace carving. 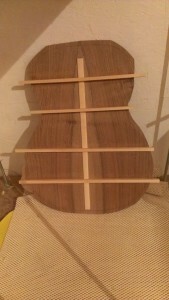 The back has been thinned to 2.8mm, allowing for some additional thinning during the sanding phase and the spruce braces glued on using the go bar deck. 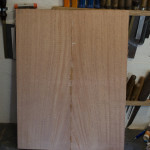 Next I got on with planing the Western Red Cedar Soundboard down to thickness again thinning this down to around 3.2mm allowing for some final reduction of thickness before finishing. 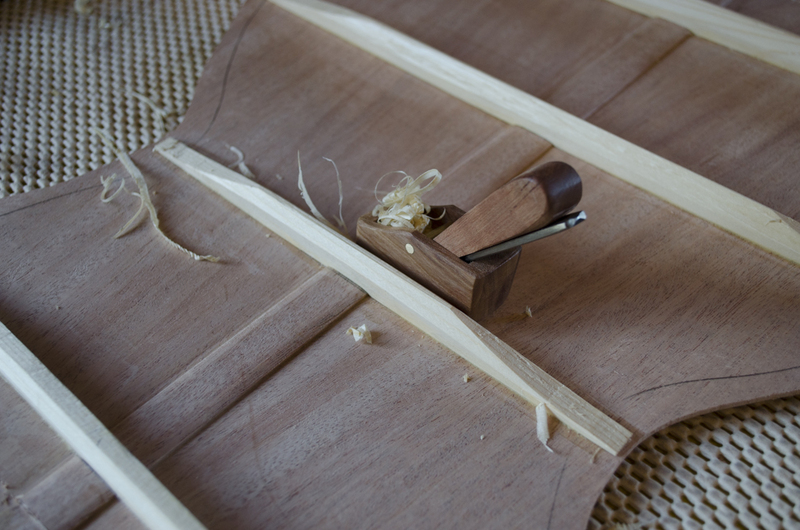 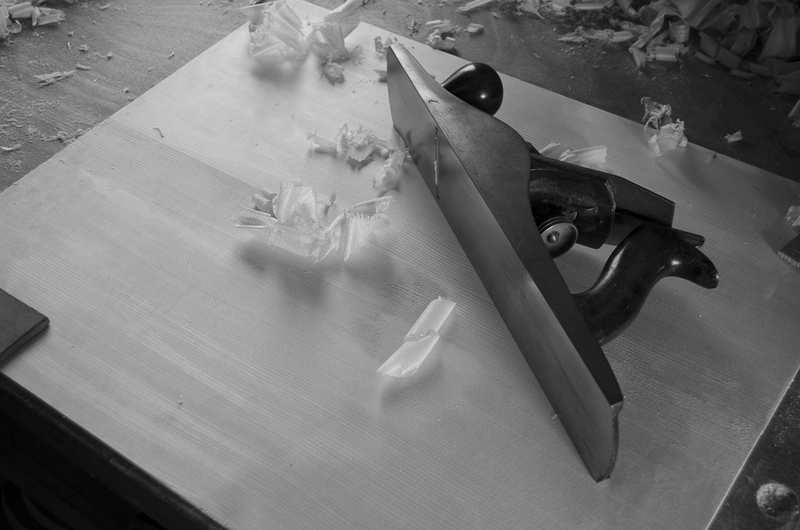 The cedar is very easy to plane, and did not take long at all to get it to the desired thickness. 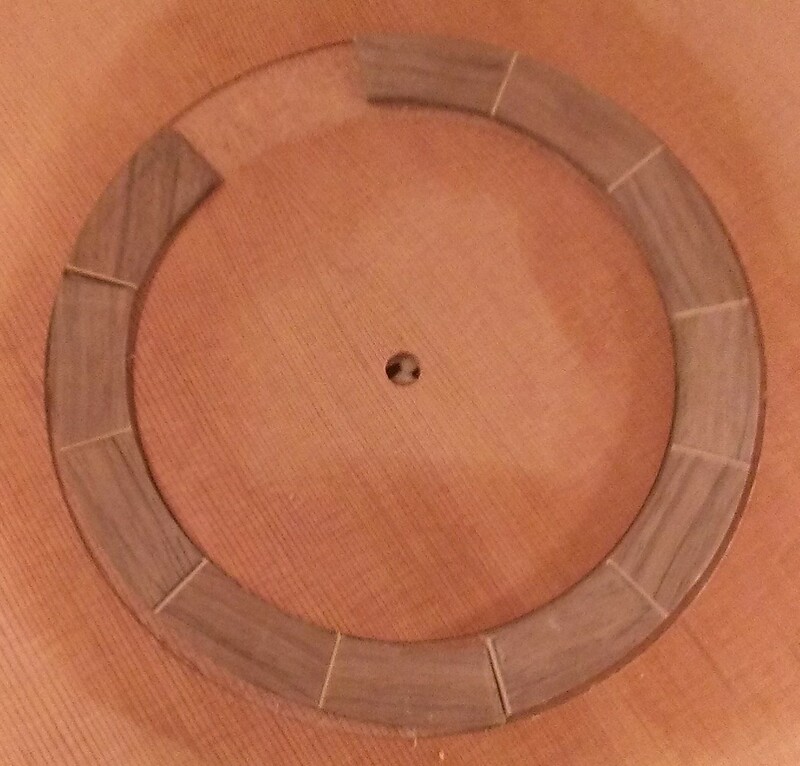 Once the soundboard was thicknessed, I excavated by hand the channel for the rosette to sit, the rosette is made up of left over walnut from the back, and is segmented with a light coloured veneer. 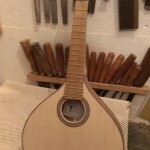 I will also be adding a matching purfling strip around the inner and outer edges of the rosette and an additional black purfling line outside these. 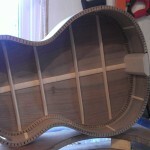 Next up will be installing the rossette and bracing the soundboard which I should hopefully get done over the next week. 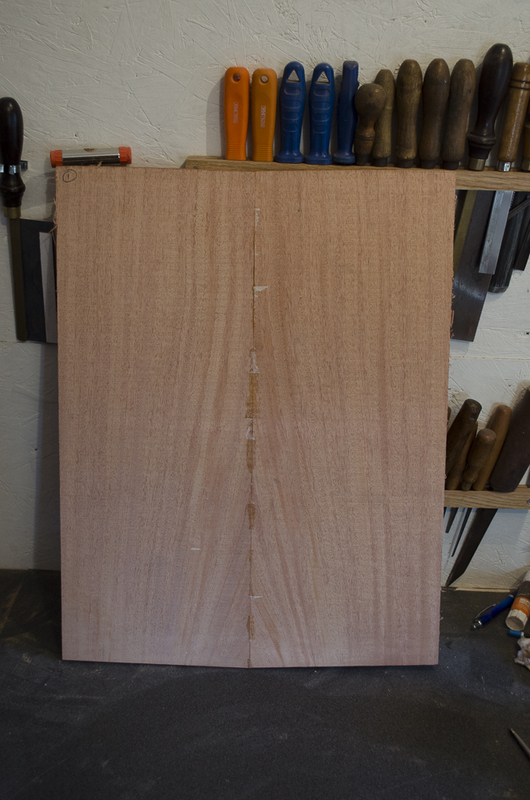 This entry was posted in English Walnut 00 on November 21, 2013 by ntredwell.